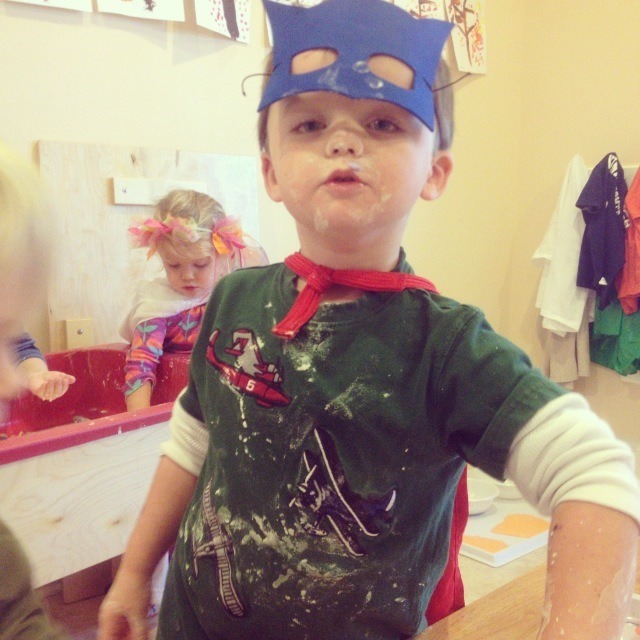 We had so much fun celebrating Halloween this fall! 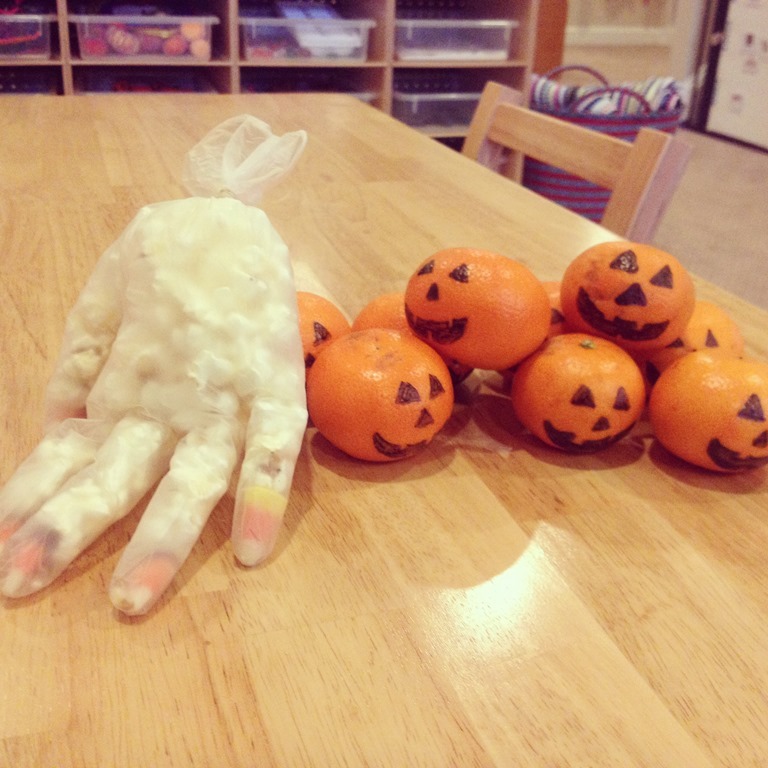 In between our study of the human body, I tried to squeeze in some spooky Halloween fun. 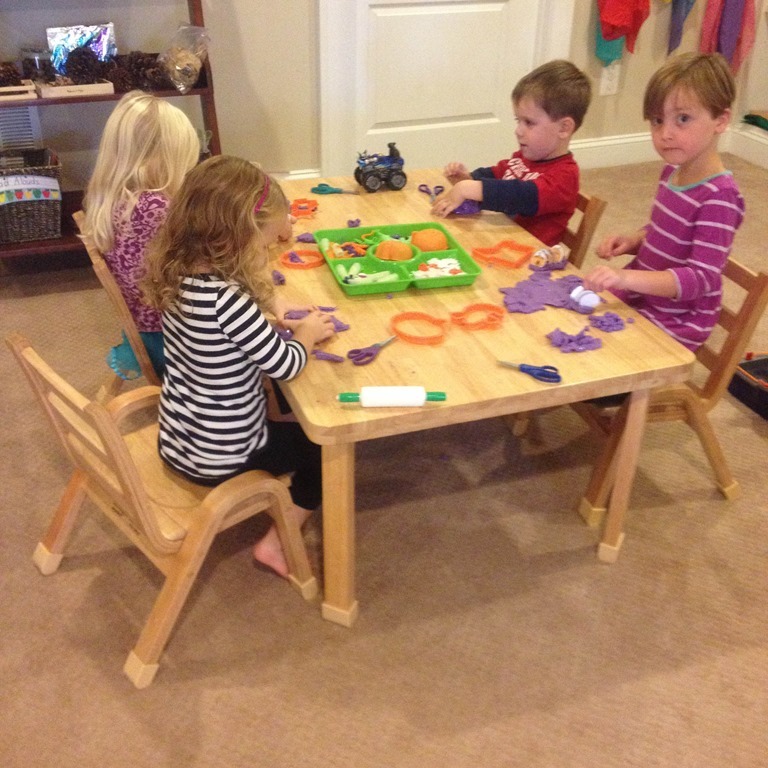 The purple glittery play dough was a hit. 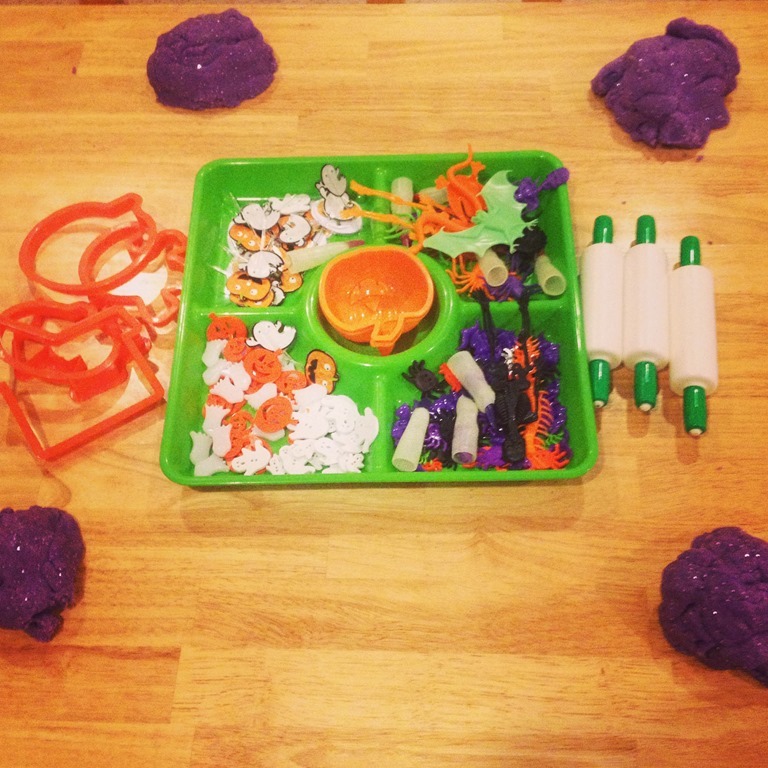 The addition of witches fingers made the Halloween play dough tray a lot of fun. 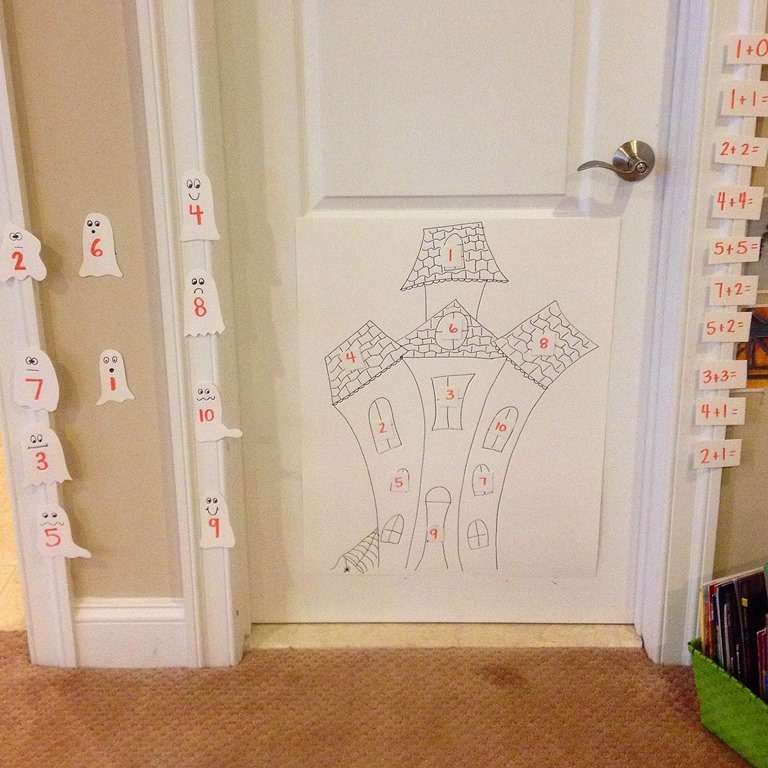 After reading the book Ten Timid Ghosts I found this great activity from No Time for Flash Cards blog. First we read the book, and a witch scares the timid ghosts out of their haunted house. 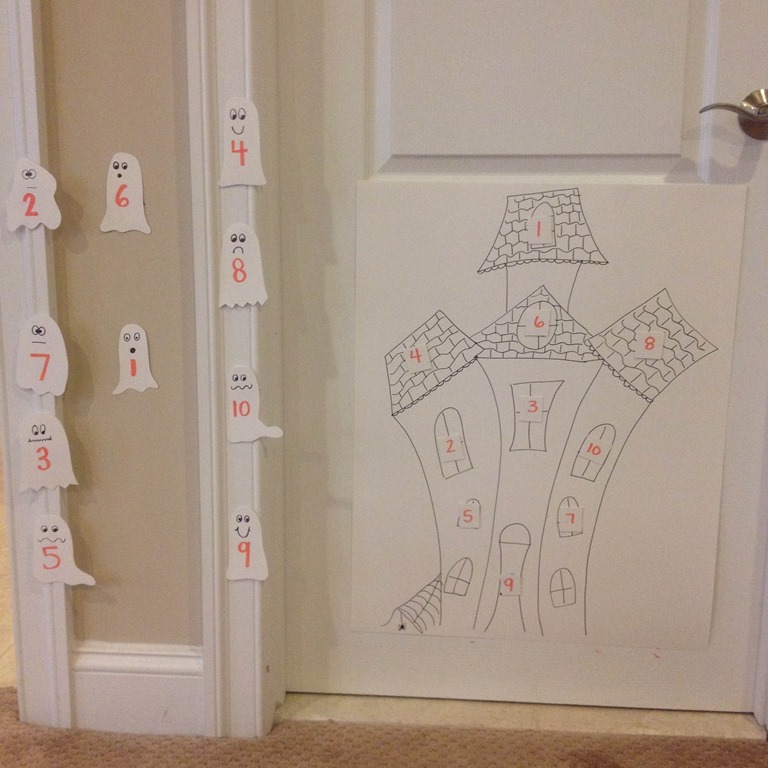 First we matched the numbers on the haunted house to the numbered ghosts hanging on the side. 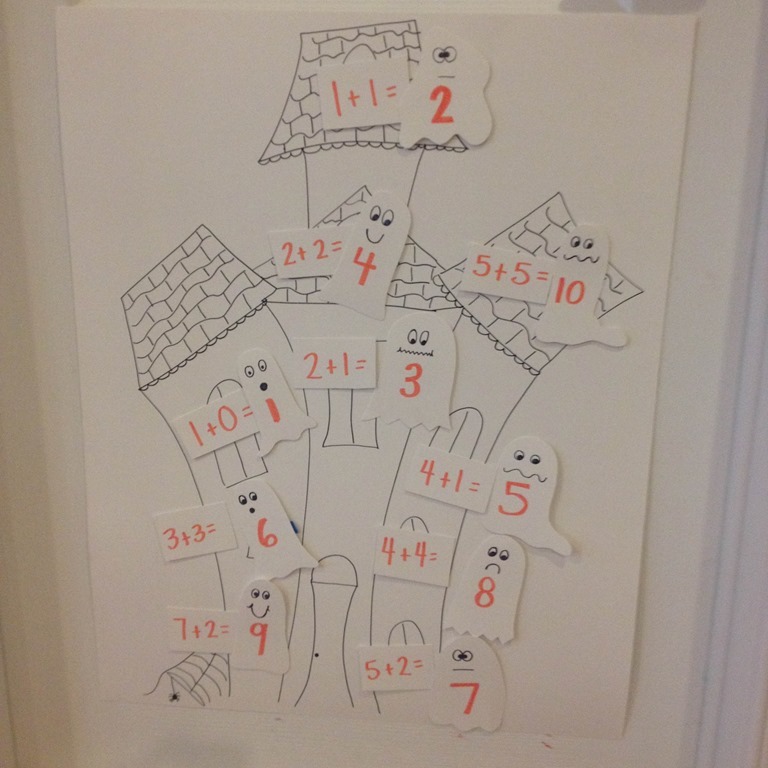 Then I put some simple addition facts on the haunted house. For most of the students this was the first time we have talked about addition and the concept of adding two numbers together. 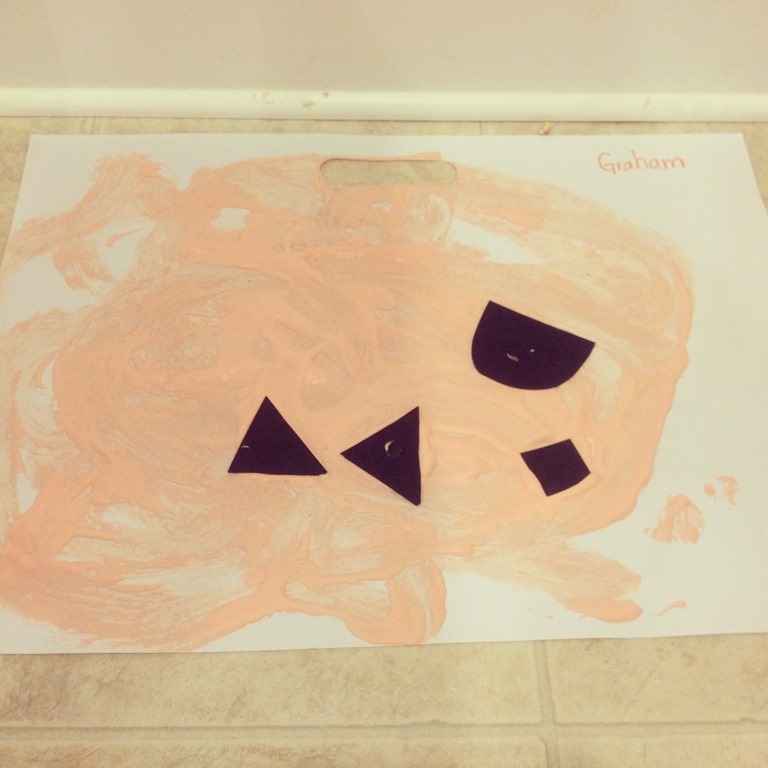 I laid out little ghost manipulatives, and each child got to come forward and add their ghosts together. 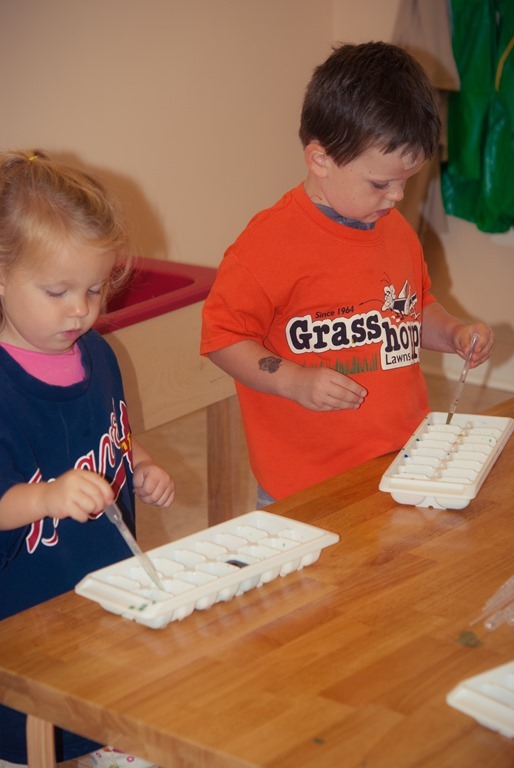 They did a great job counting, adding, and using one to one correspondence when they were counting up their ghosts. 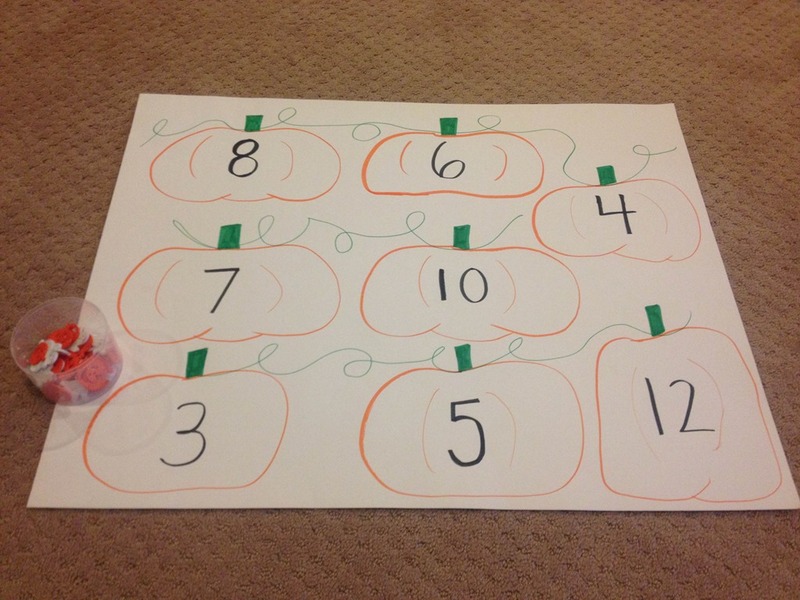 Another fun math activity was our pumpkin counting board. 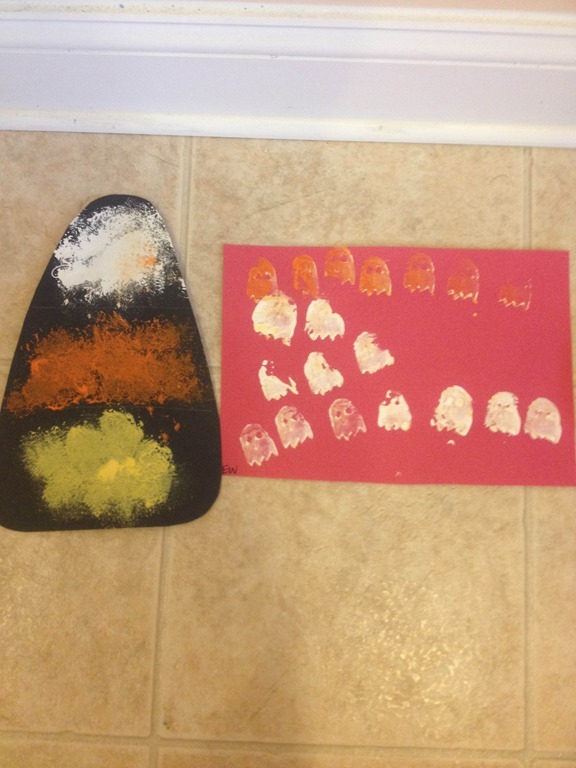 We matched the correct number of ghosts and pumpkins to our big poster board. 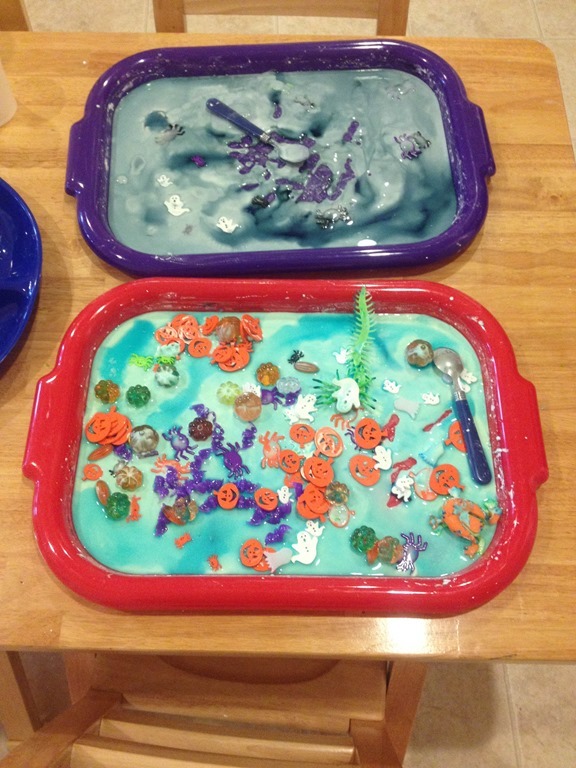 For some sticky fun, I made a batch of gray and blue oobleck on trays in the art room. 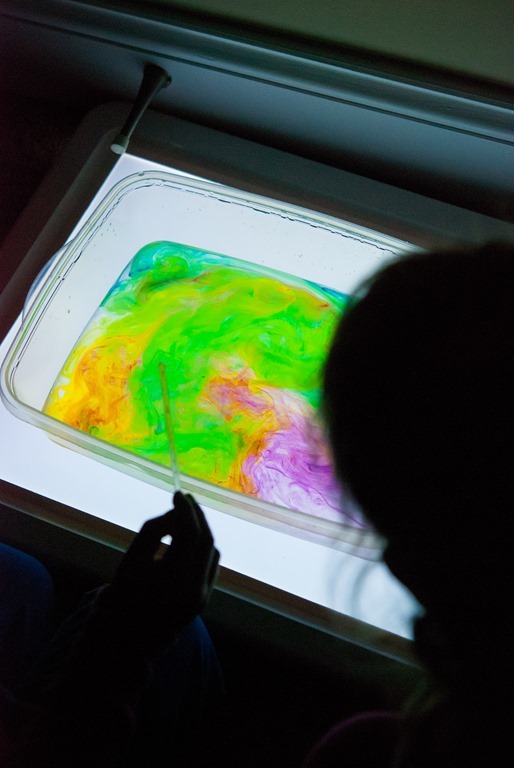 The oobleck is a mixture of water, cornstarch, and liquid watercolors. 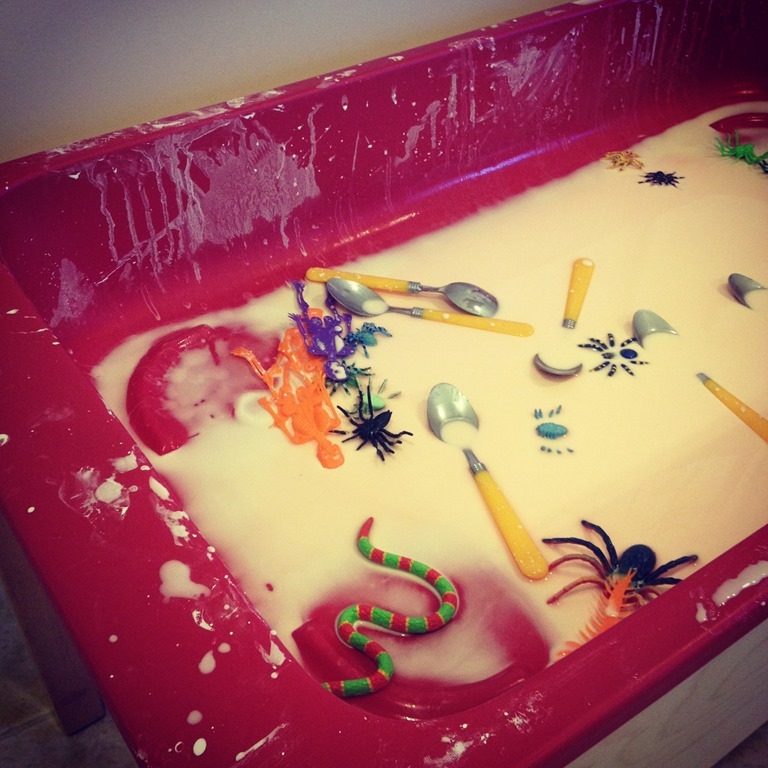 They had fun using the spoons to mix up the oobleck or their hands! The trays looked like this at the end of the morning! The weather was still fairly mild the week before Halloween. I took advantage of the warmer temps and set up a colorful witches brew outside at the sensory table. 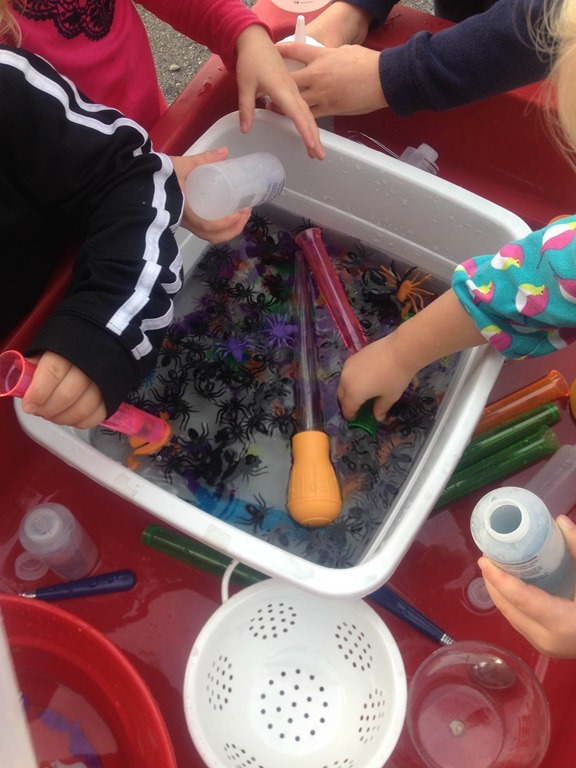 I had test tubs, basters, buckets, and lots and lots of colorful water. We played this over a couple of mornings and it never seemed to get old! 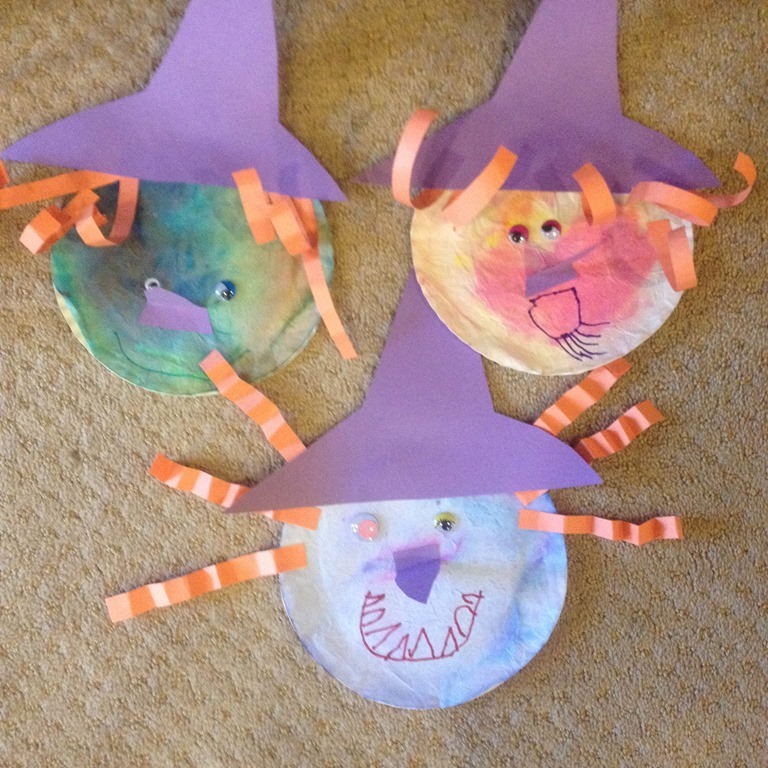 We also made some witch faces! Each child colored a coffee filter and then sprayed it with water. Once the coffee filters were dry we glued them onto a paper plate. Each child added all of the facial features and they even used folding skills to make crinkly or curly hair. 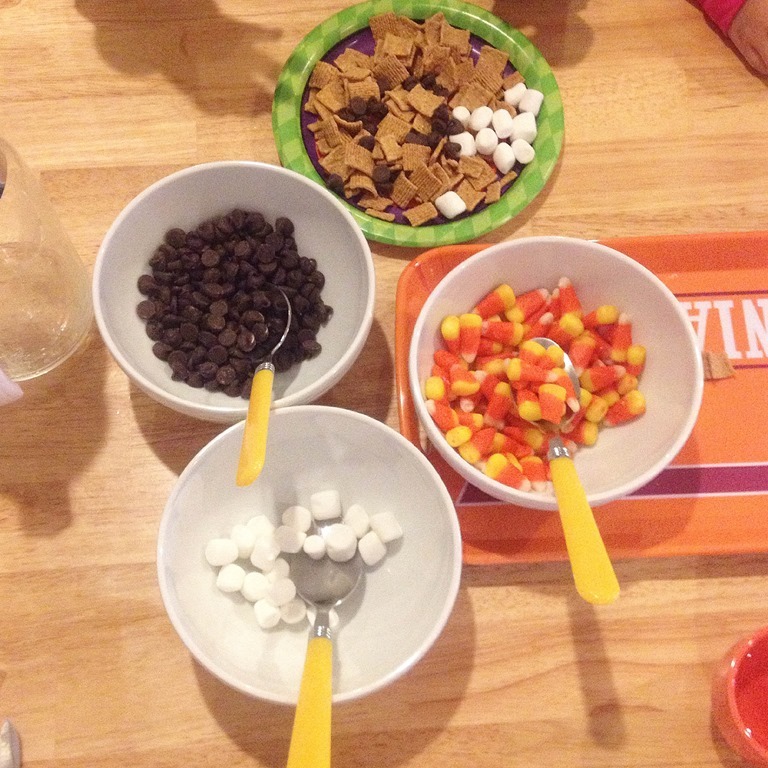 I think the children’s favorite part of Halloween was snack! 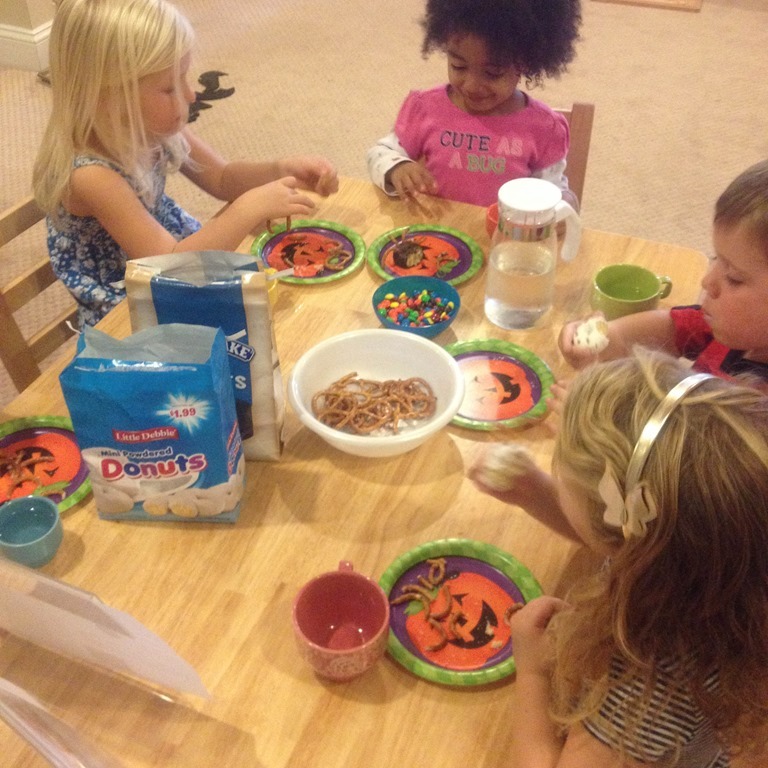 Each day I made a set of instructions for them to create their own Halloween themed snack. 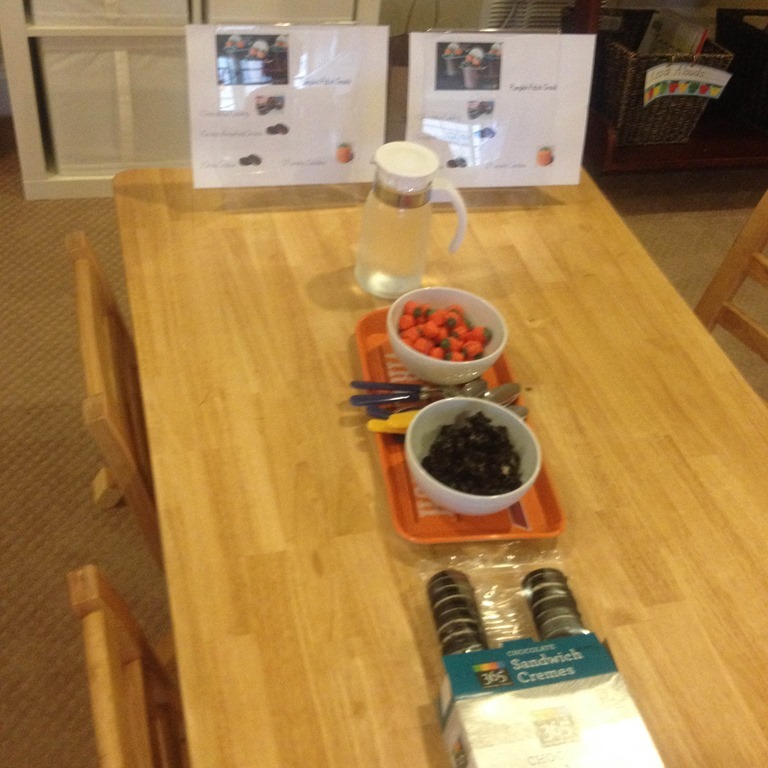 I placed the instructions with pictures on the table for the children to follow and make their own snack food. Of course we don’t usually eat these treats normally, so the children thought this was extra special! This snack was a pumpkin pudding with crushed Oreos! 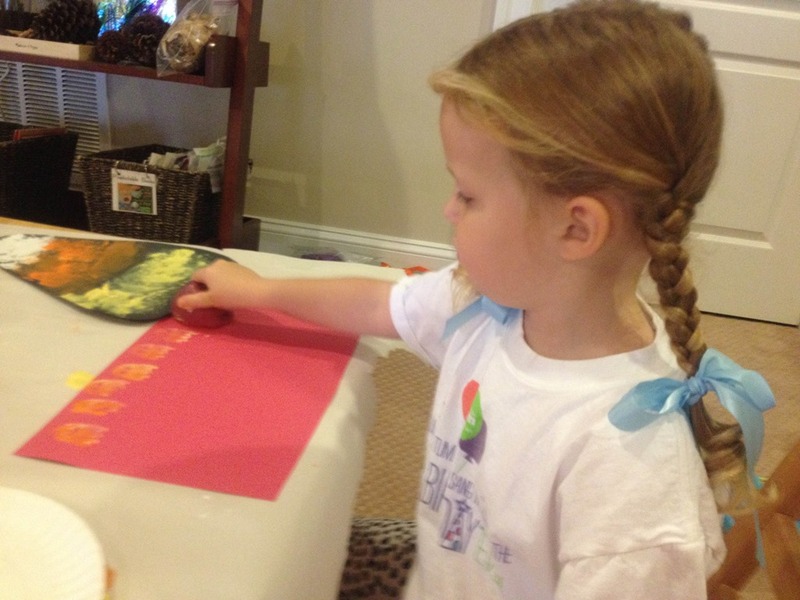 The kids had fun making some simple stamping crafts. 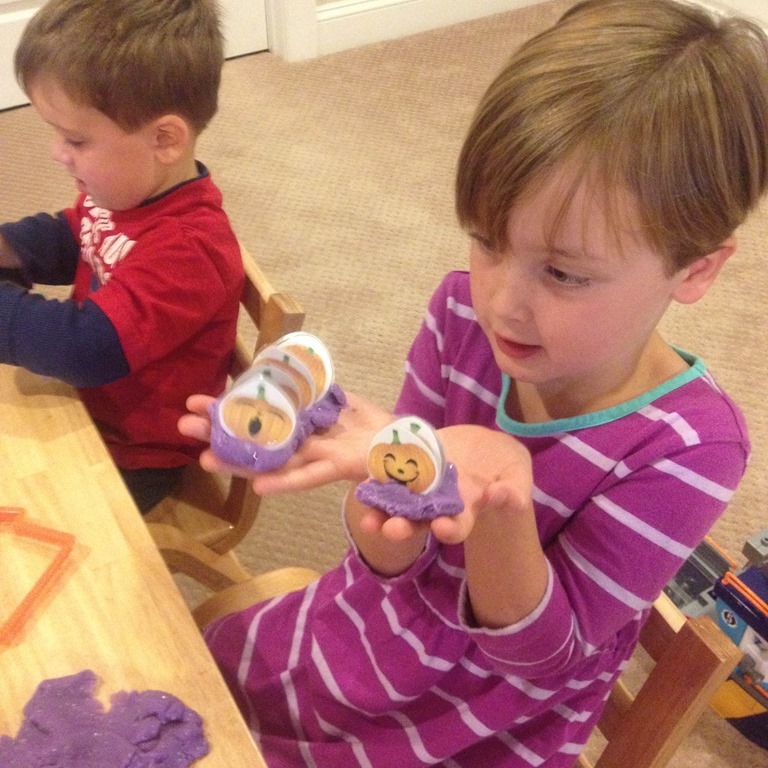 They made candy corn and stamped ghosts using potato stamps. 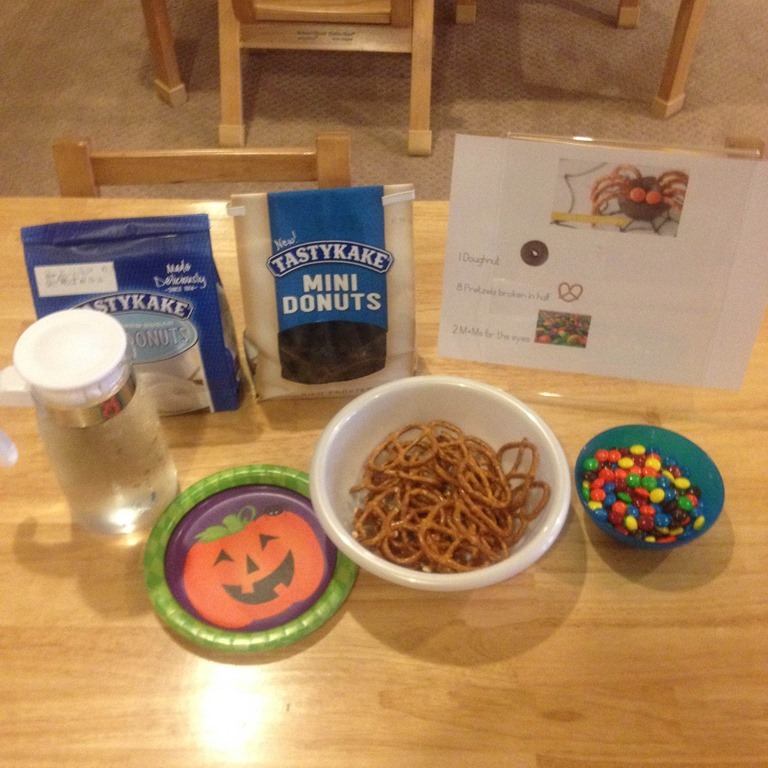 The biggest treat was the fizzing spider experiment. 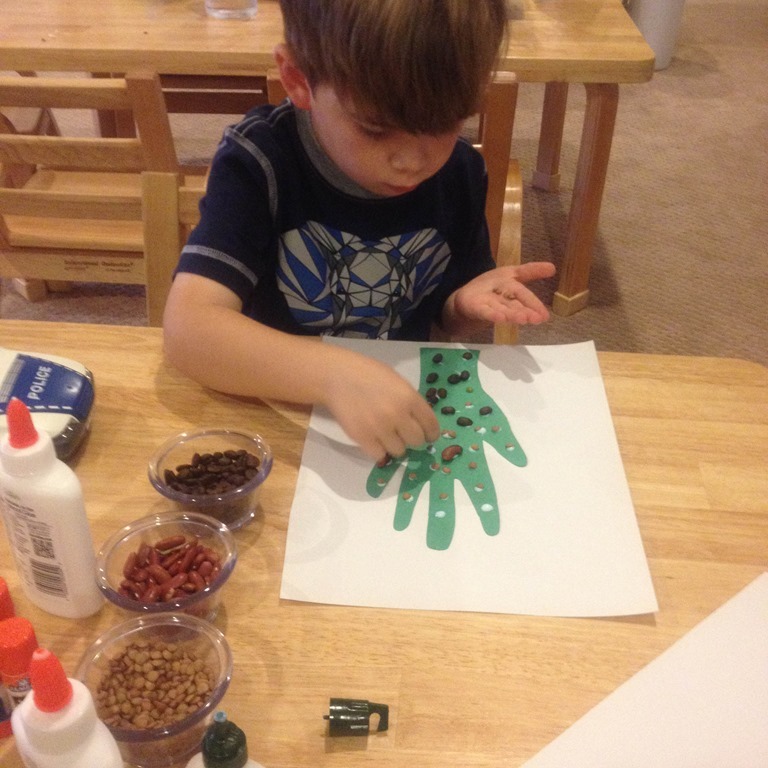 I found this great idea from Fun at Home with Kids. I made a mixture of baking soda. water, and liquid watercolors. You form the baking soda into balls and then freeze them until you are ready to use them. Then I got a large tub and filled it with vinegar. 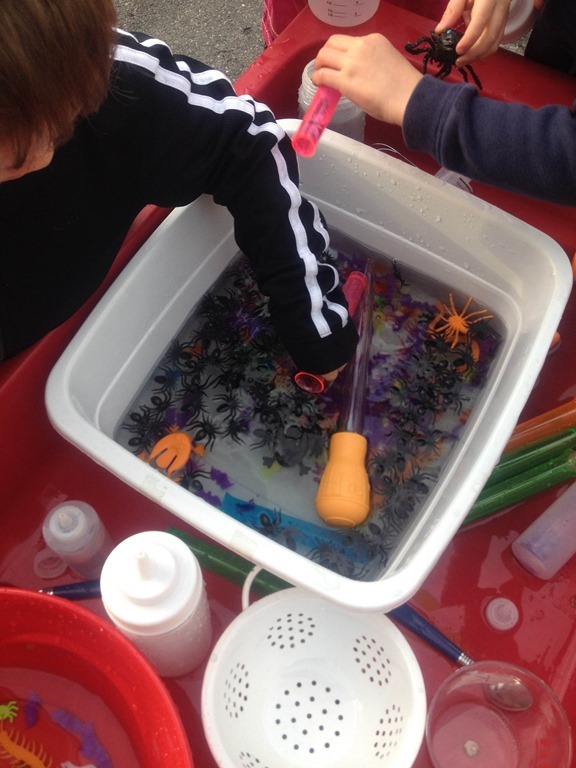 Each child got to put one spider in at a time and watch their spider fizz and pop. 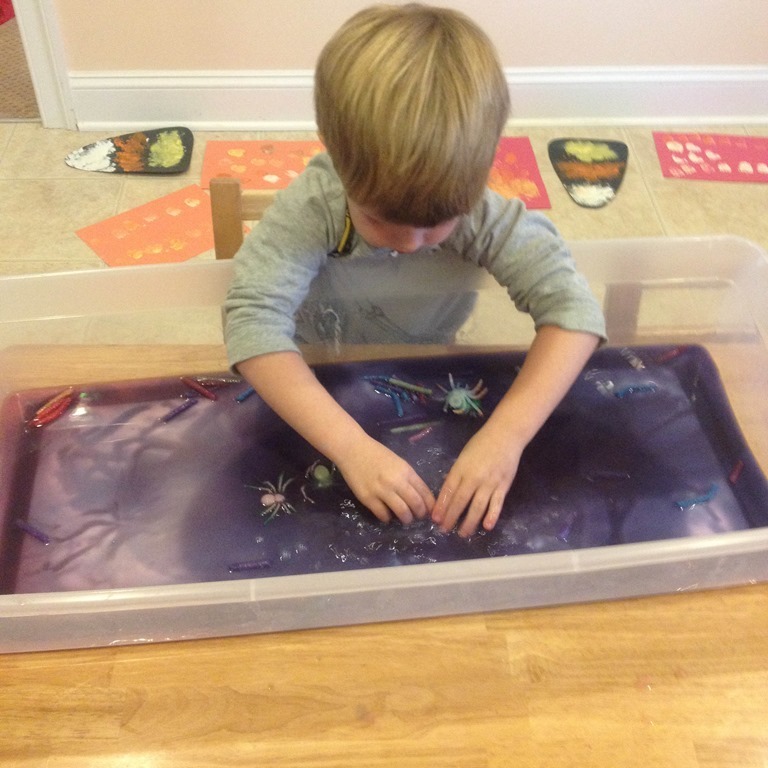 Leo even had fun exploring the vinegar after the project was done! Each spider had a plastic spider hidden inside. They kept calling them their spider babies! I am hoping to get back on track with my seasons and blog posts soon! 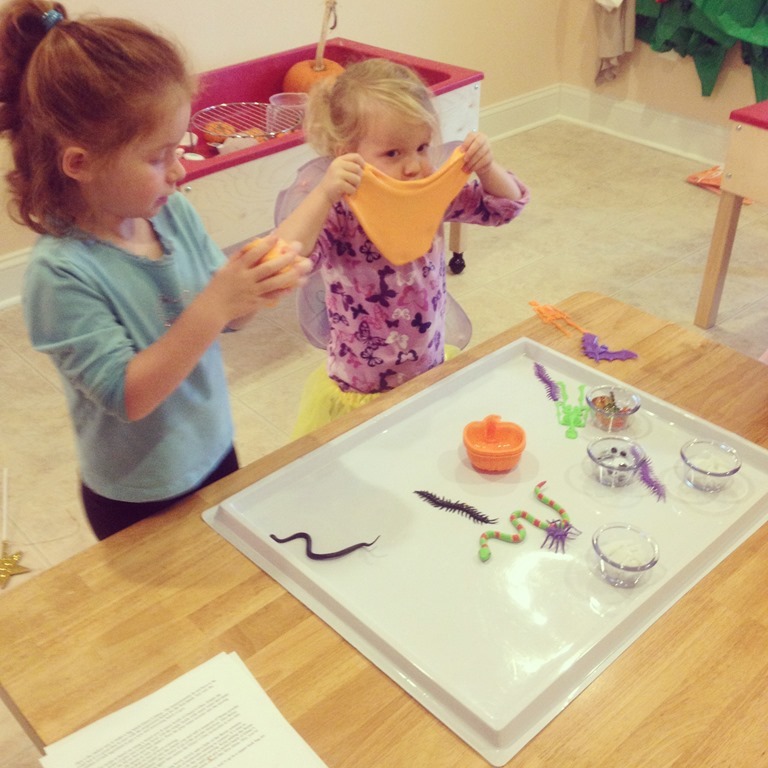 Categories: preschool, preschool science, sensory play | Tags: halloween, halloween fun, halloween preschool activities, play based preschool, sensory play | Permalink. I know we are all sick of Halloween, but I have a few more pictures to share about our last few days of Halloween fun from this year! Both groups were really interested in spiders when we are playing with all of our Halloween themed items in the classroom. I dug through my non fiction books and found a treasure trove of great books and pictures of spiders. 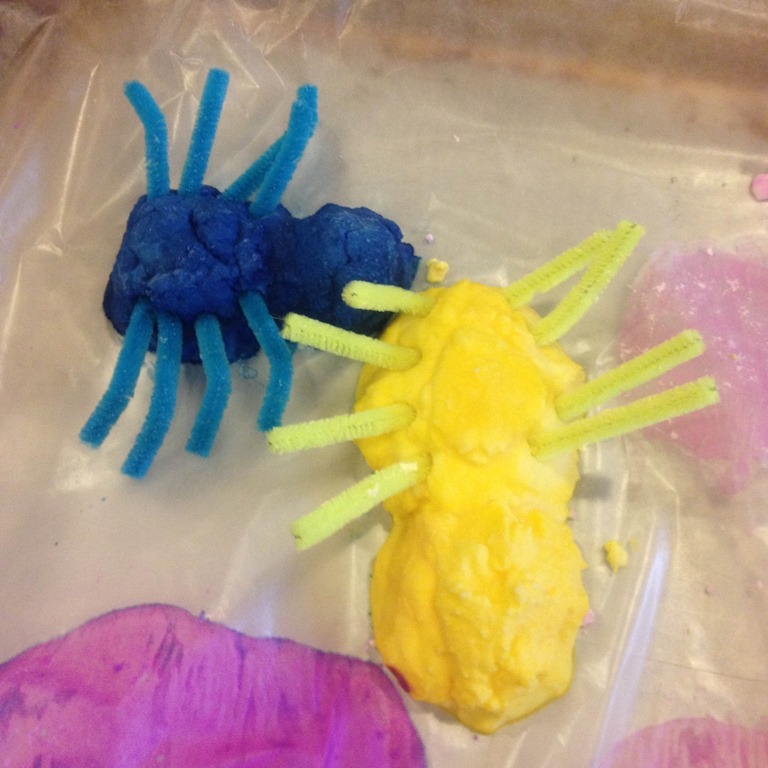 I decided to make a spider themed play dough tray with black play dough and glitter. 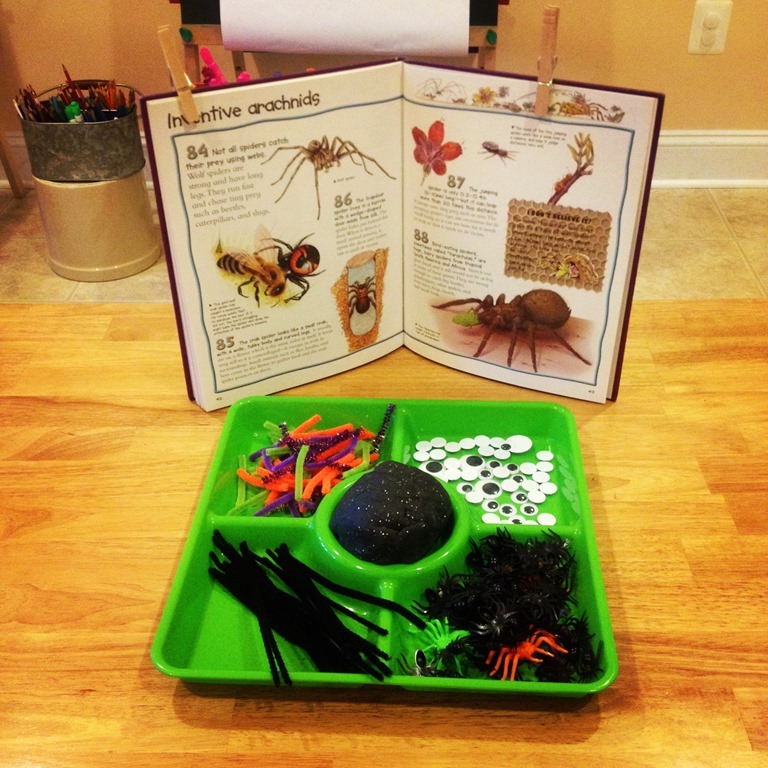 Behind the play dough tray I opened up one of my larger non-fiction books to information on spiders. They dove right in making their own spider variations with the dough. 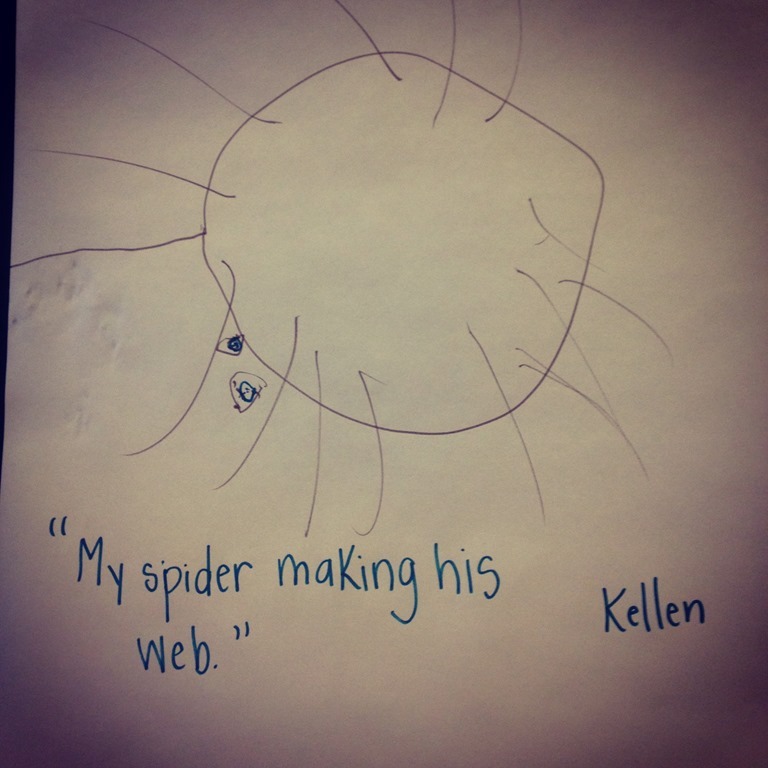 Then K in my younger group walked over to the easels and started to draw a spider on the easel paper. I had to get a picture of him transferring his ideas to paper. 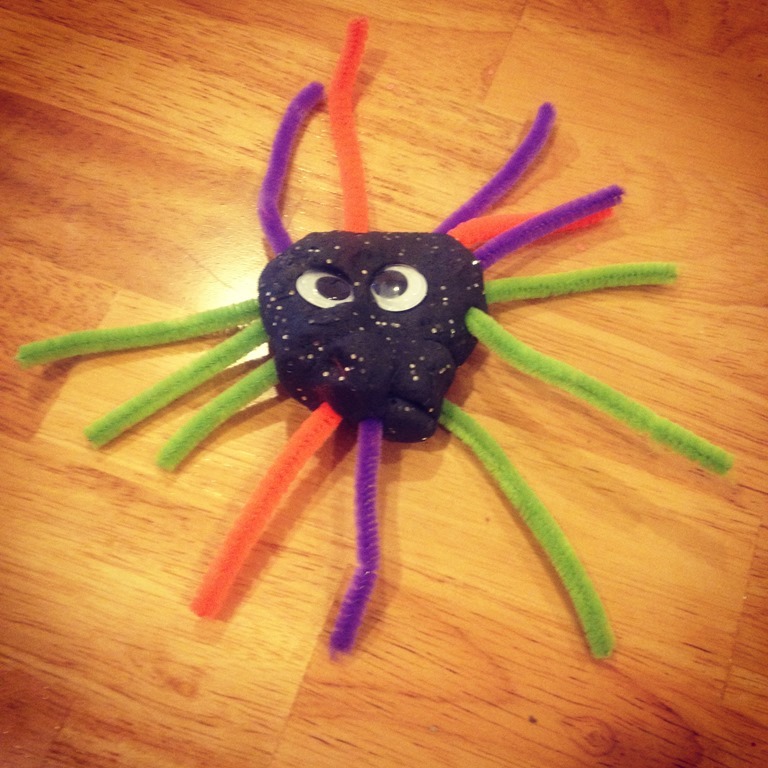 I was impressed with his version of a spider, even including the eyes! 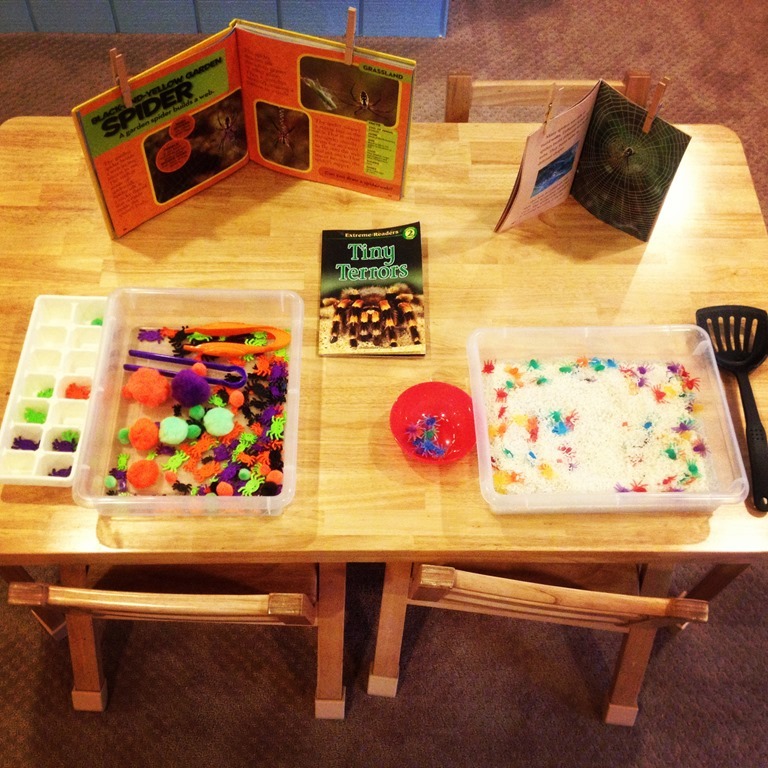 I also set up some spider themed learning/sensory trays for the kids to look at more closely and view more great spider pictures I found. 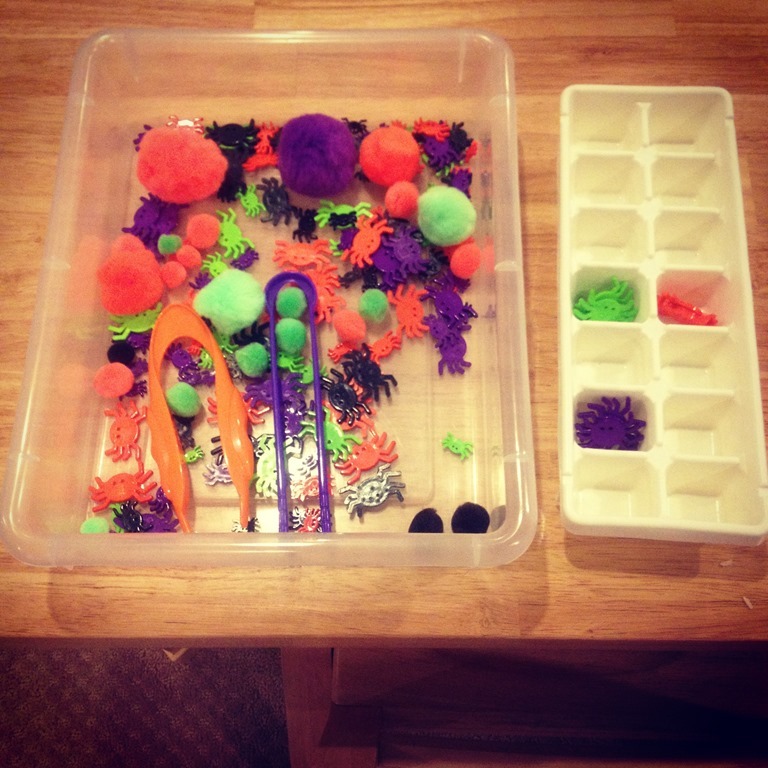 On the left is a spider sort, with different colored spiders, pom poms and tongs. 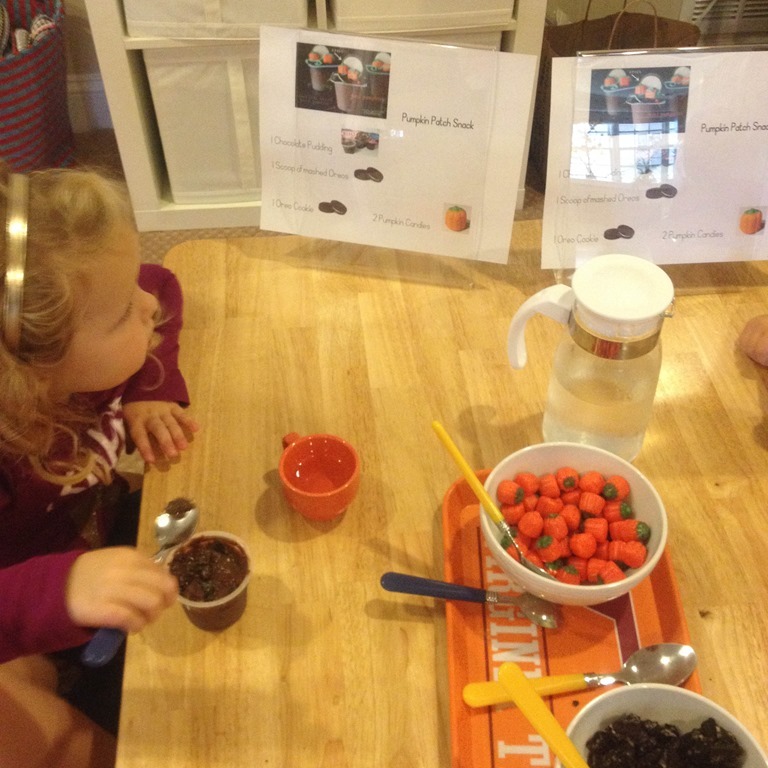 On the right is a spider sifting activity where they sifted the spiders from the rice using a spatula. This proved to be difficult for many of the students. 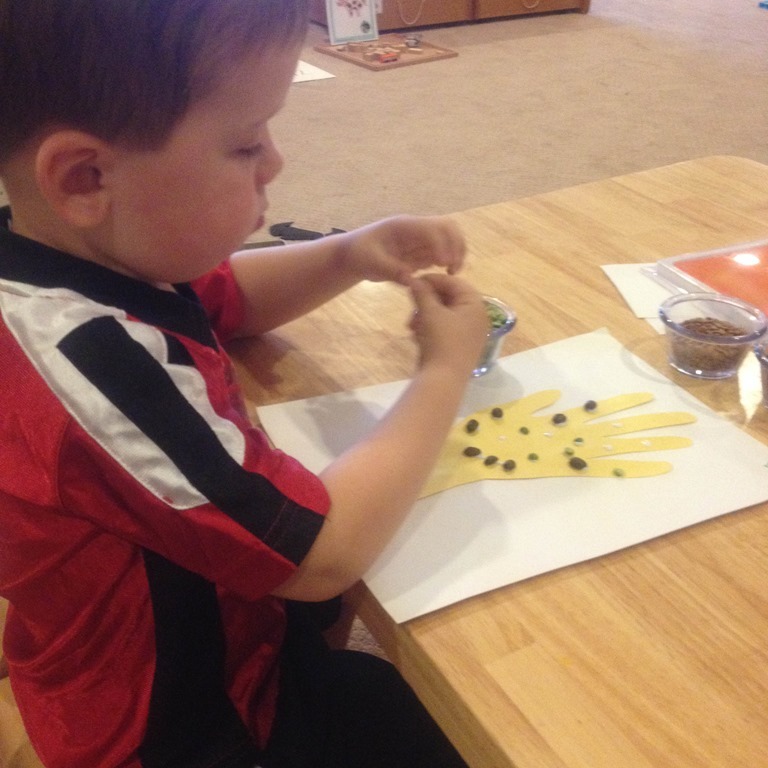 We will have to work on our fine motor/sifting skills! 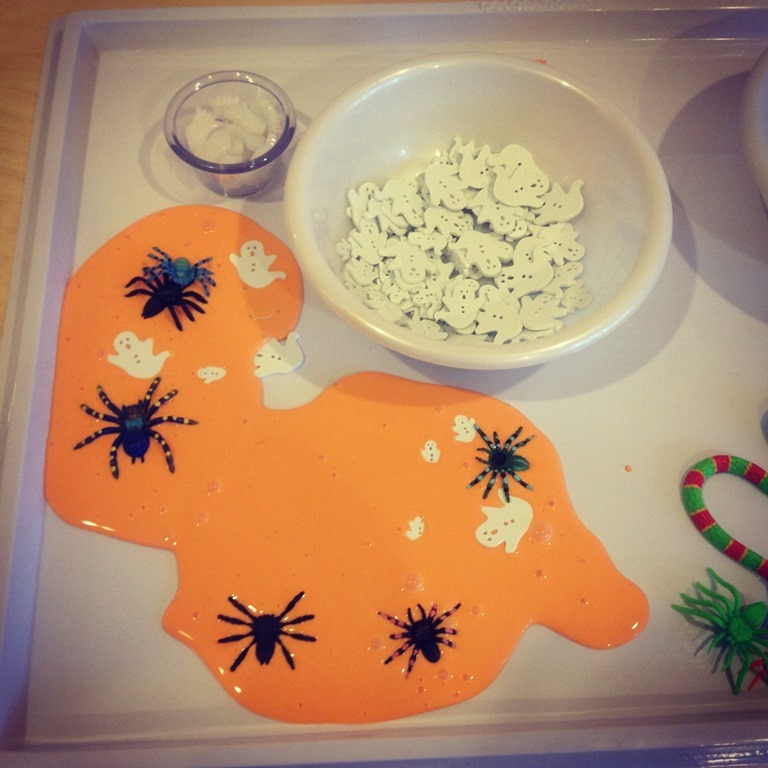 I also added a bunch of spiders to our wonderful orange gak that continued to be a hit in the art room! 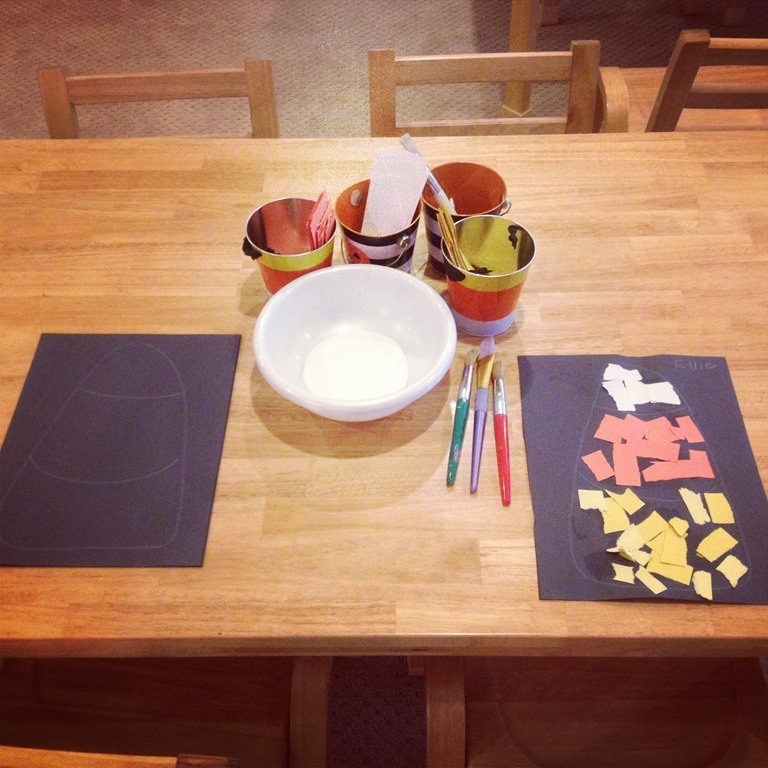 For a wonderful fine motor activity the kids ripped construction paper to create their own candy corn collages. And for a wonderful process art activity we made puffy paint using a mixture of equal parts glue and shaving cream along with orange food coloring to create orange puffy paint. Once they painted a pumpkin I gave them different shapes for the eyes, nose and mouth to turn their pumpkin into a jack o lantern! The final product was quite lovely, with a mixture of raised “puffy paint” and sunken in areas that just looked like orange paint. I feel it is important to give the children as little direction as possible when they are in the middle of a process art project. 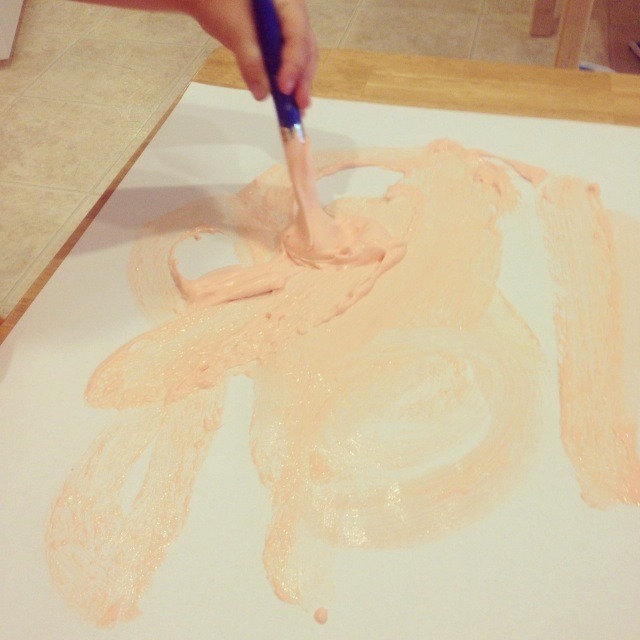 G spent a huge amount of time dipping his paint brush into the gooey paint and swirling it around and around on his paper. It is more about the process than the final product looking like a perfect pumpkin. One of my mommies happens to be a special education teacher who is home with her young children. She purchased this corn from the local farm store, and let us borrow it for two weeks! 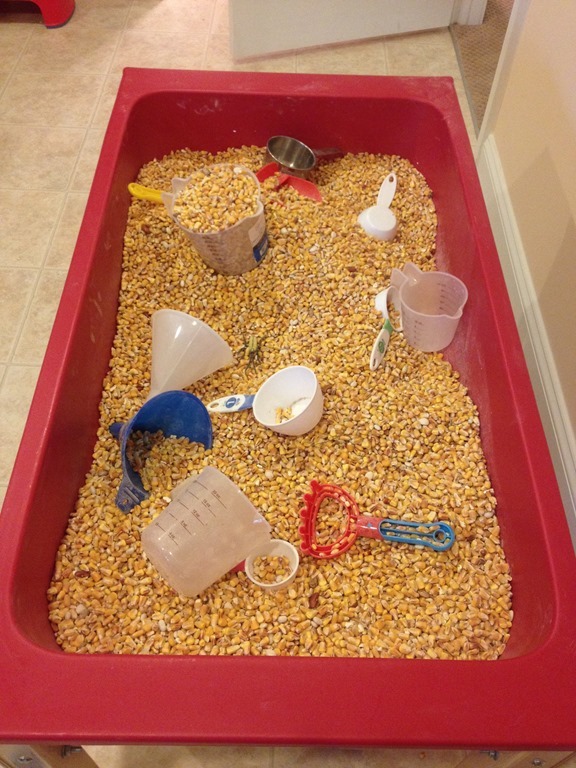 Corn and scoops was one of our favorite and most visited sensory tubs. The simpler the better! Thank you Jessie! 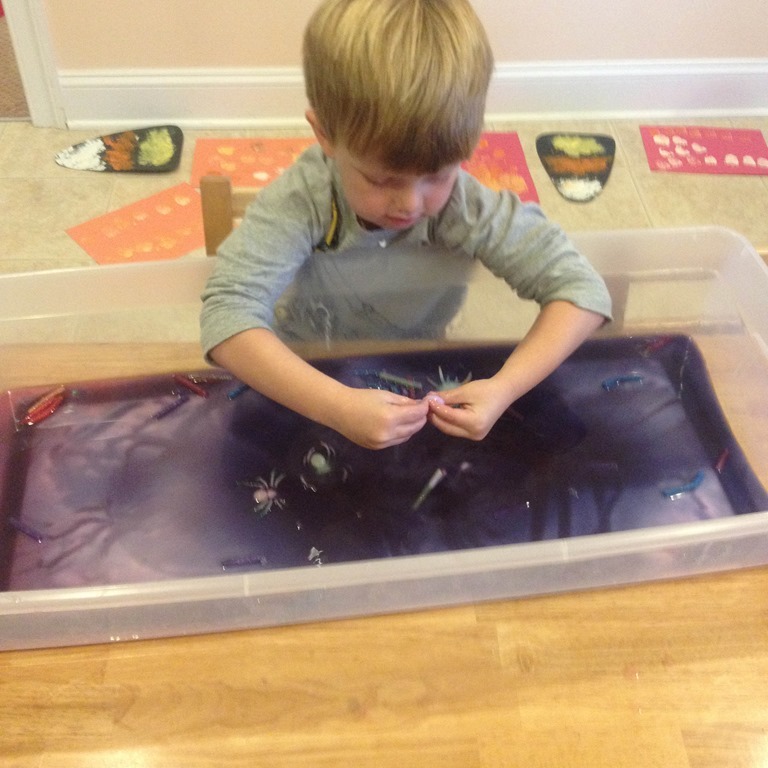 I changed the Halloween creepy crawler sensory bin just a bit. I removed the black beans and added a huge collection of water beads. If you haven’t played with water beads, they are from the floral section of the craft store. They can shrink in size when out of water, and tend to expand when submerged in water. 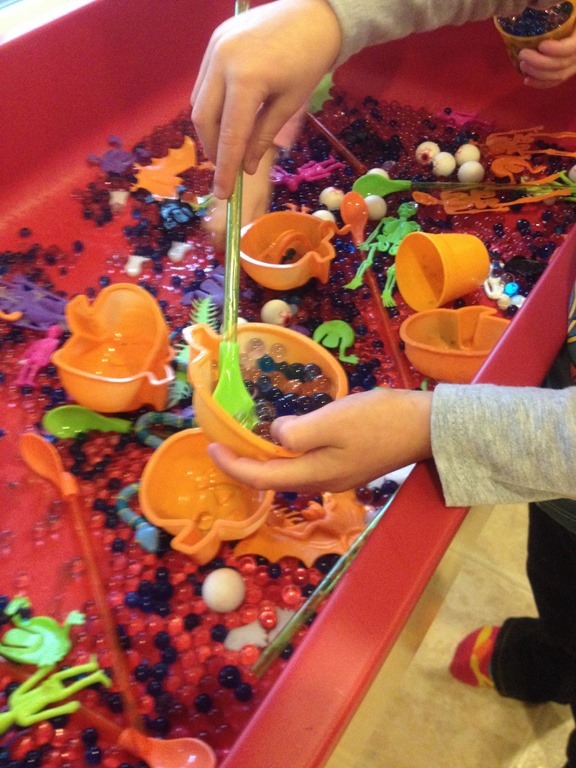 Water beads are such a fun sensory tool, they pour, scoop, squish, escape, and the kids loved exploring with them. They also look really interesting on the light table! We also made Goop. 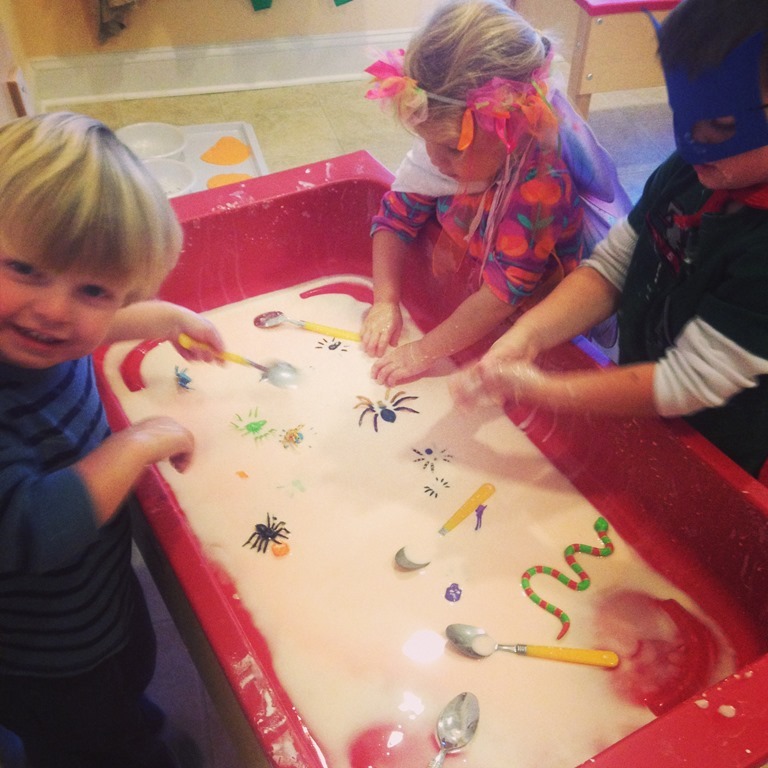 Goop is a wonderful, sticky, slimy sensory activity. It is a combination of cornstarch and water. I learned the hard way that you only need little bits of water (the first batch turned into soup). 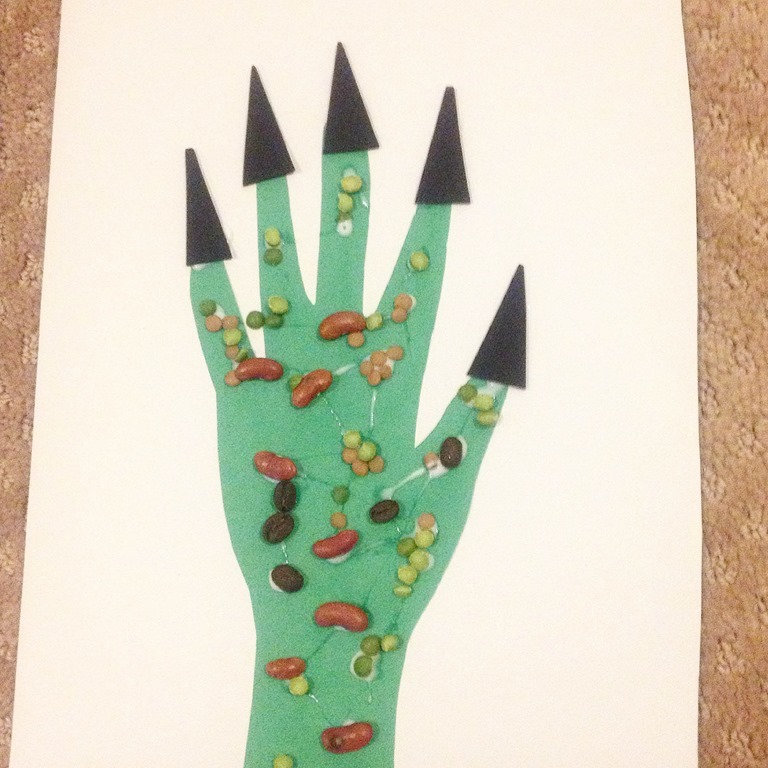 I added some orange liquid watercolors and some of Halloween creepy crawlers to the goop to spark their interest. pour the cornstarch into a bowl. Slowly begin to add water a little at a time until you have stretchy, slimy mixture. Too much water and your goop will be soupy, too little water and your goop will be too sticky to pick up. 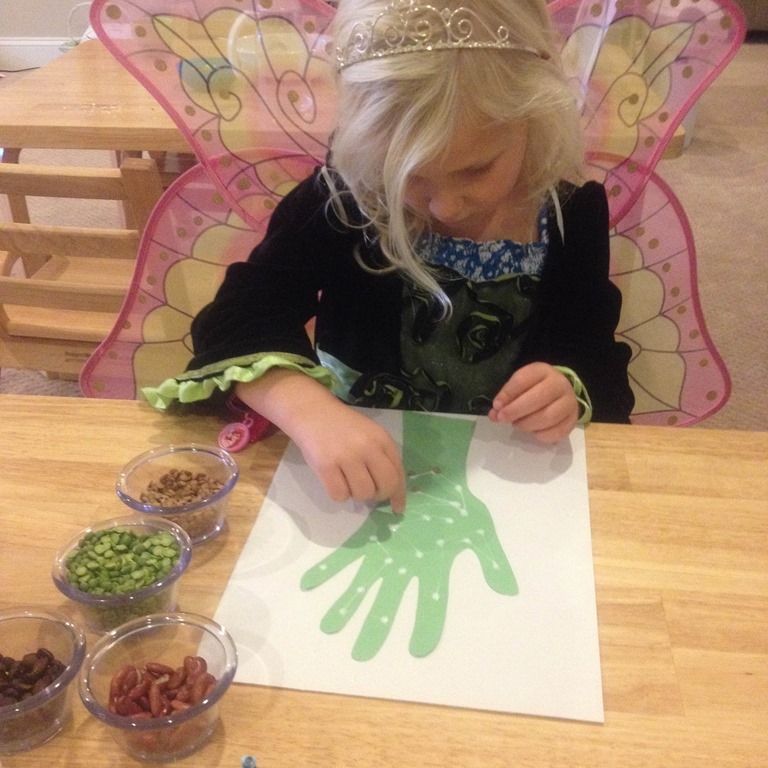 Add glitter, food coloring, plastic animals or insects, gems, and get dirty! Some of us really had a ball with it though! 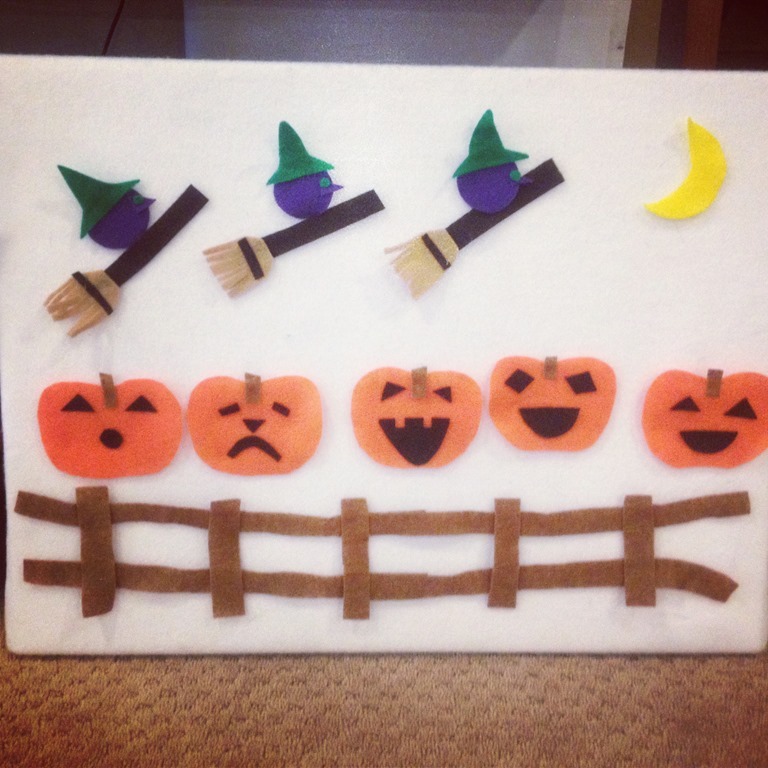 For some of our more traditional activities we sang, acted out, and used the Five Little Pumpkins Sitting on the Gate felt board during our song book story time. 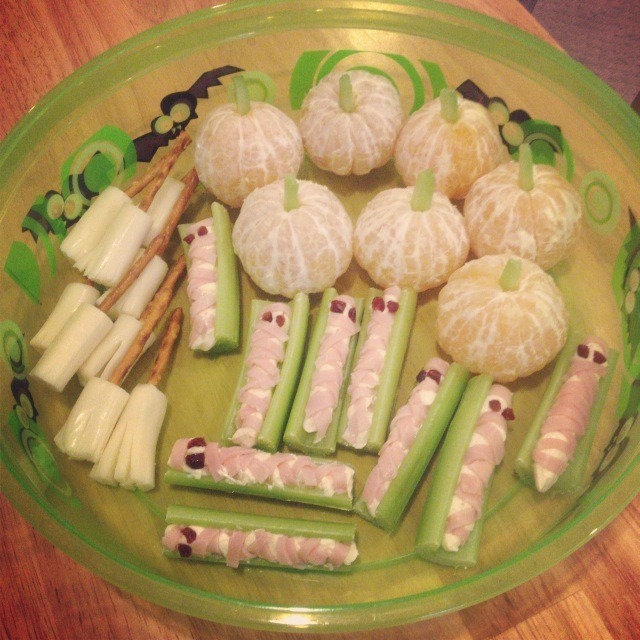 We also had parents bring in some fabulous Halloween themed snacks the last week of October. I didn’t get a picture of all of them, but a special thank you to Jessie, Dina, Lynn, and Jill for making our Halloween week so special. 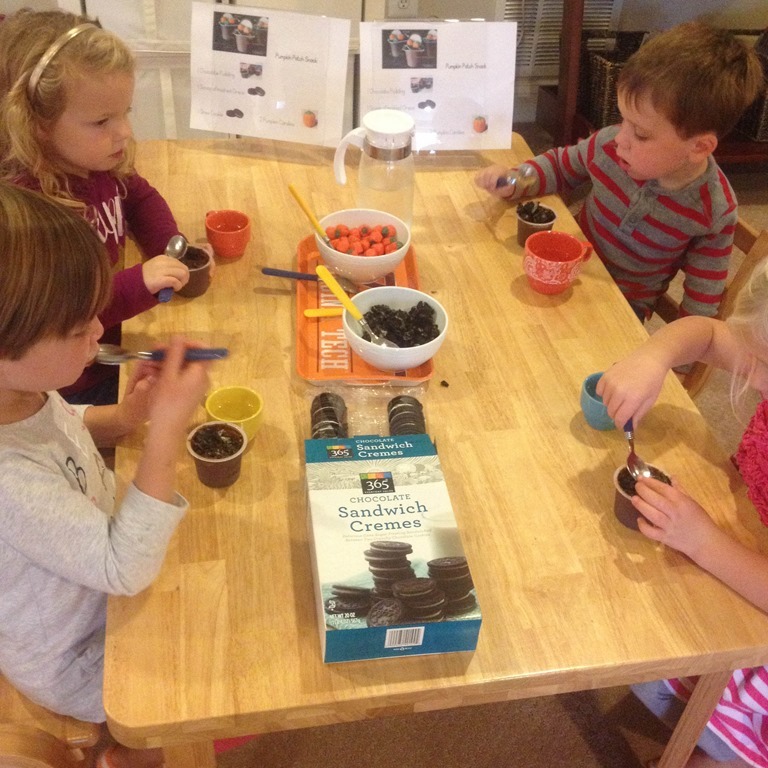 The kids truly enjoyed and got such a kick out of the snacks. Thank you parents for all of your help and donations to make this a wonderful holiday for the kids! 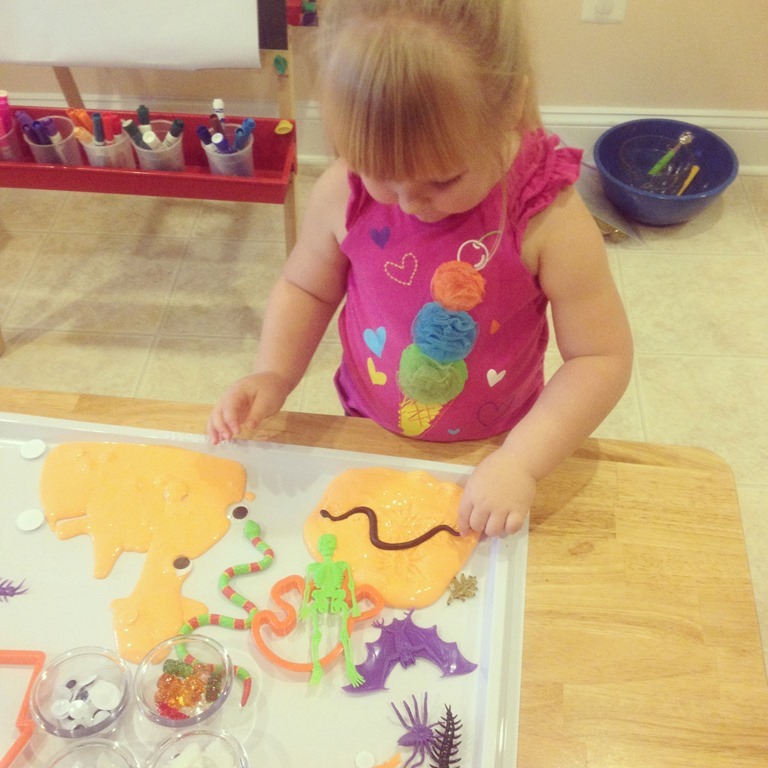 Categories: home based preschool, play based learning, preschool, reggio emilia inspired, sensory play | Tags: halloween, halloween fun, halloween preschool activities, holidays, play based preschool, play dough, preschool science, science, sensory materials, sensory play, sensory tables | Permalink. 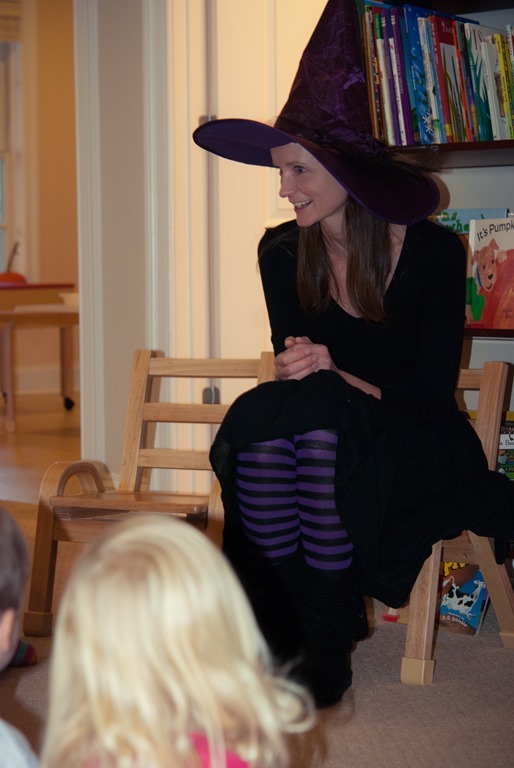 Last week a witch stopped by our classroom for a visit! She was a nice witch luckily and she brought a witch book along with a really fun witch potion activity. 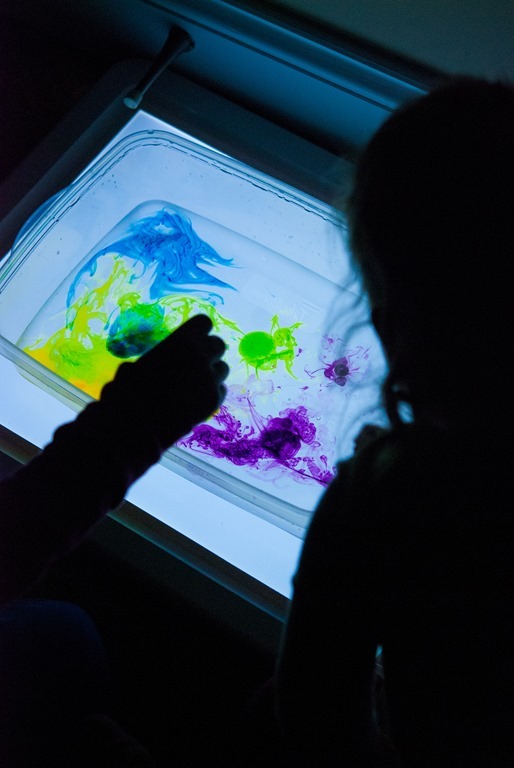 The children got to make their own witches brew on the new light table. They made the brew by squeezing their own combination of colors into the water. 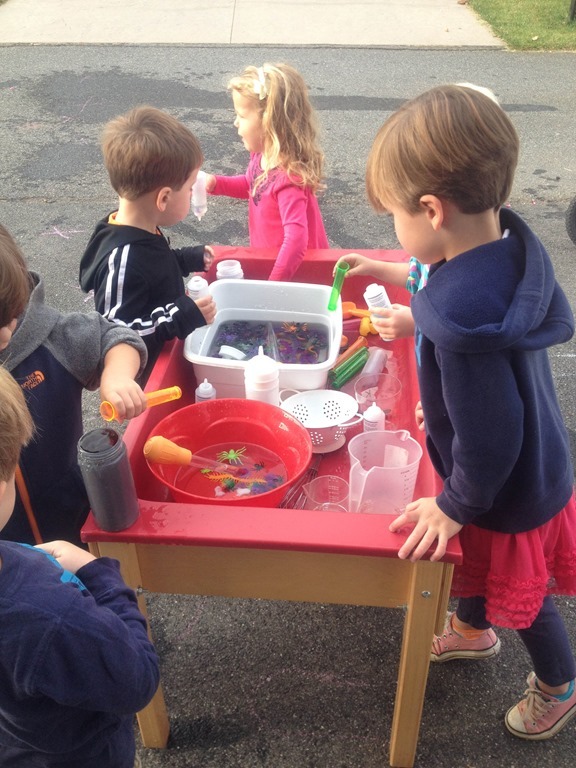 Using their magic wand they stirred the water to create a new color. 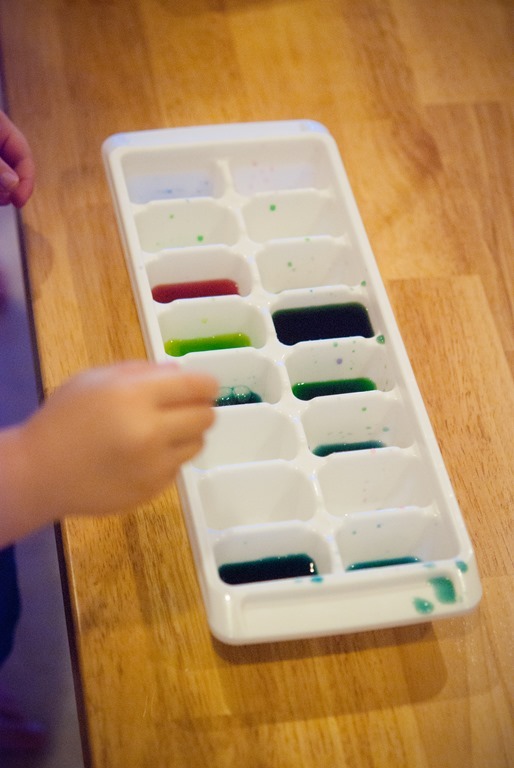 Watching the colors mix up was such a magical process for the grown ups and kids alike! 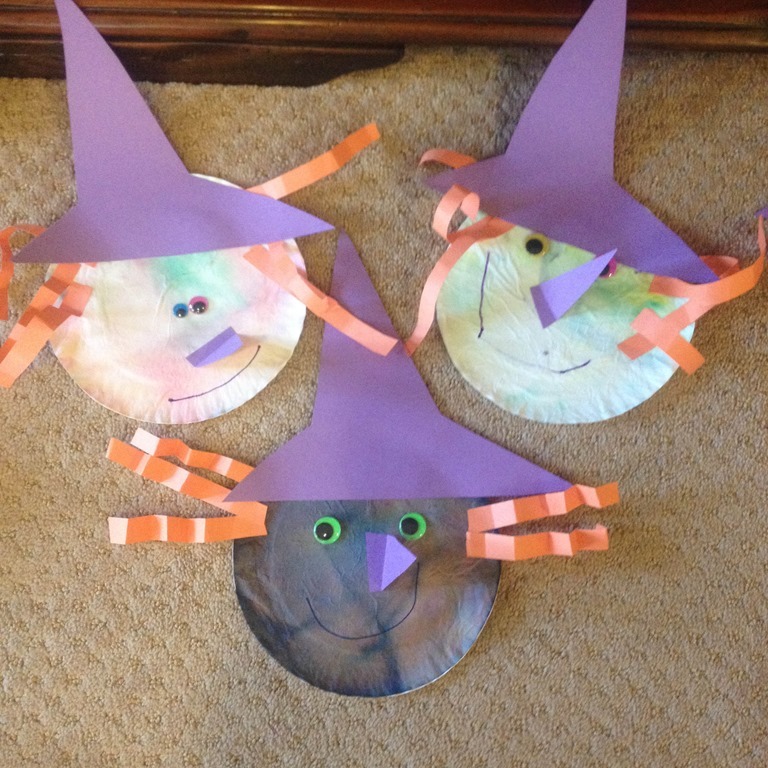 Thank you Sarah for helping us have such a witchy fun morning. We had a blast with you! 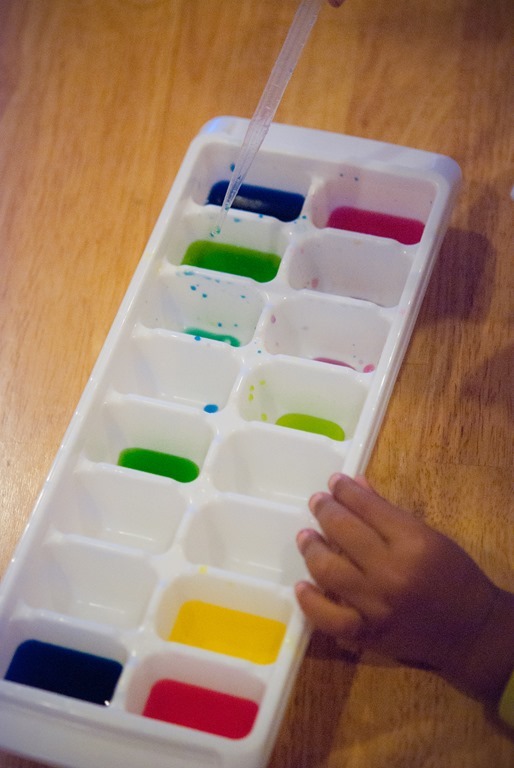 This color mixing exploration was a great follow up to our previous color mixing we did this month with the ice cube trays. 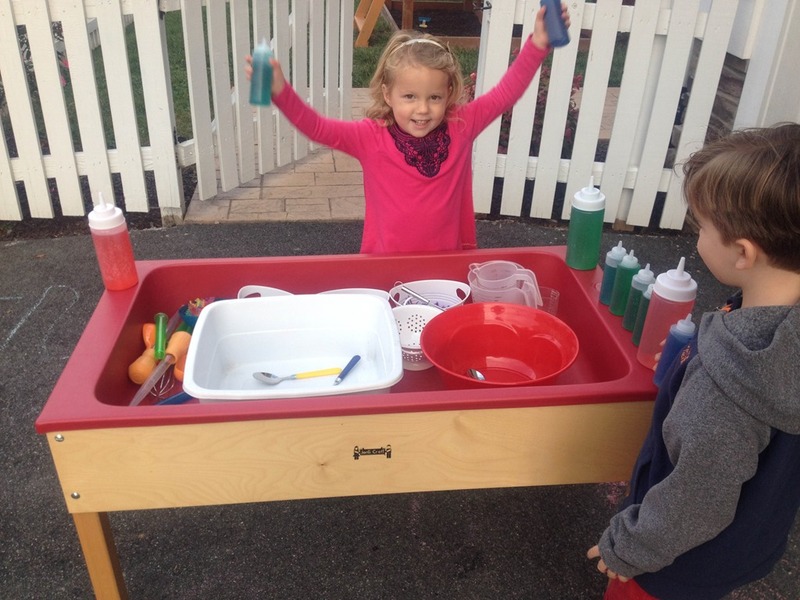 I was able to capture some more images of children working at the tables squeezing, mixing, and dropping. 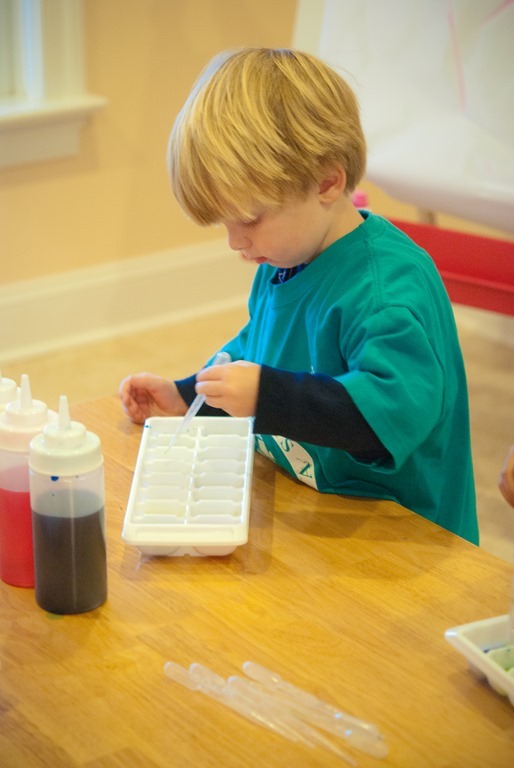 Understanding colors is a primary part of early childhood education. “Knowing our colors” might seem to be such a basic skill, but color knowledge is the beginning of all math, science and literacy learning. 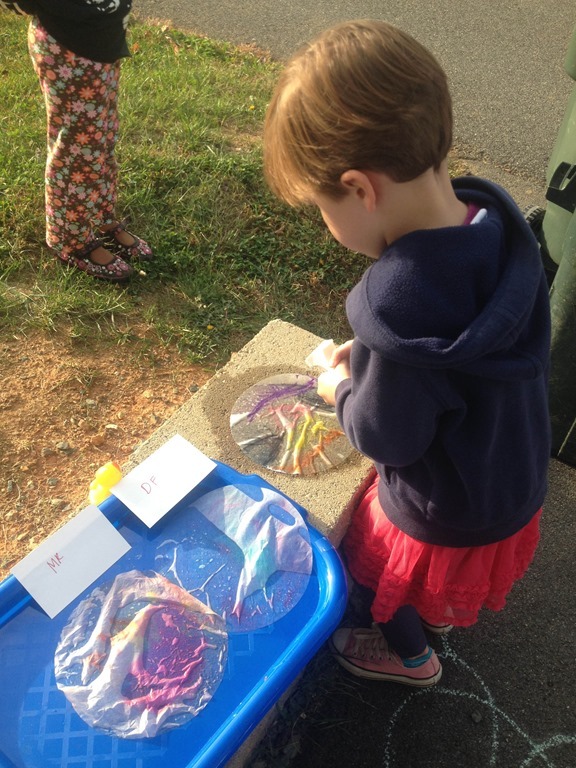 Color words are often some of the first words that children use as descriptors of objects, shapes, and the world around them. We use color knowledge all of the time in our world, from noticing the changes of the seasons, folding laundry, to shopping at the grocery store. 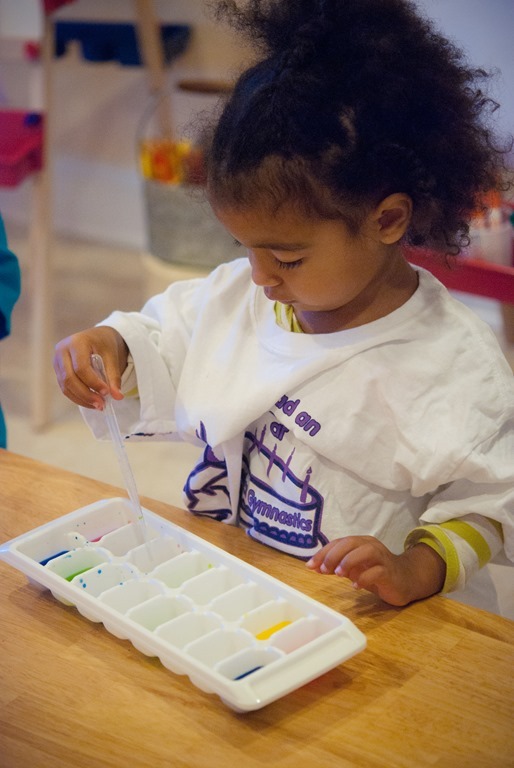 When children begin to explore beyond basic colors, but even their hues they begin to assimilate items in their world. 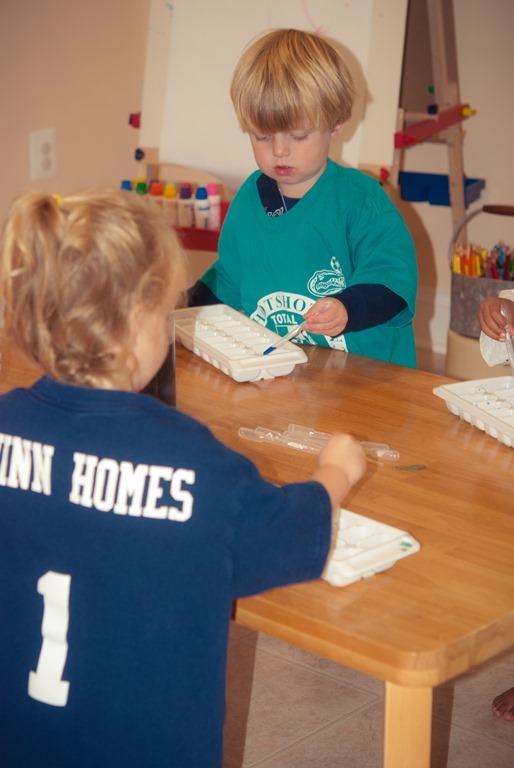 When your child begin to discern differences in colors and shapes they will then be able to tell the difference between letters and numerals. 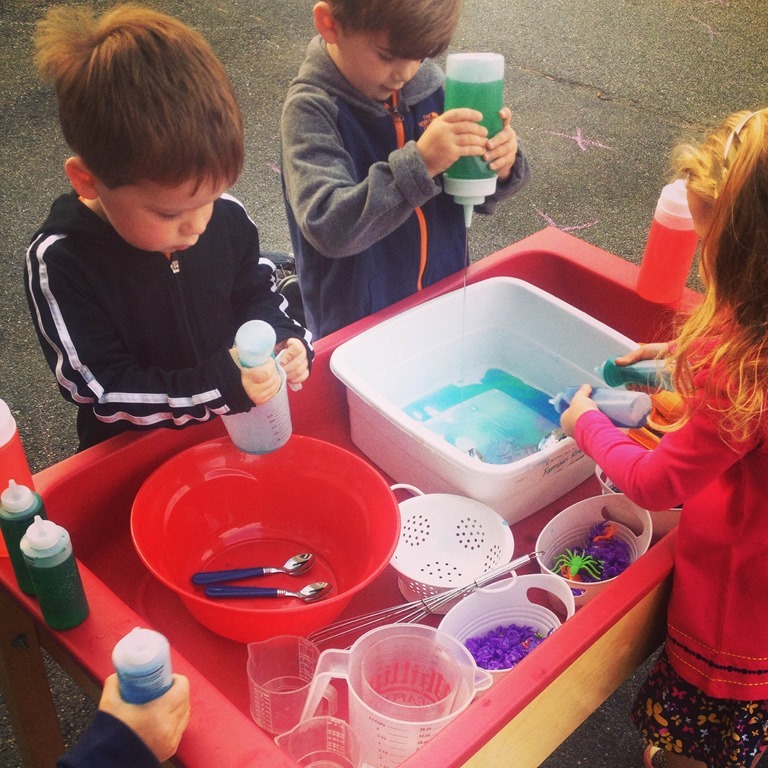 We aren’t simply playing with colored water, we are learning through play! 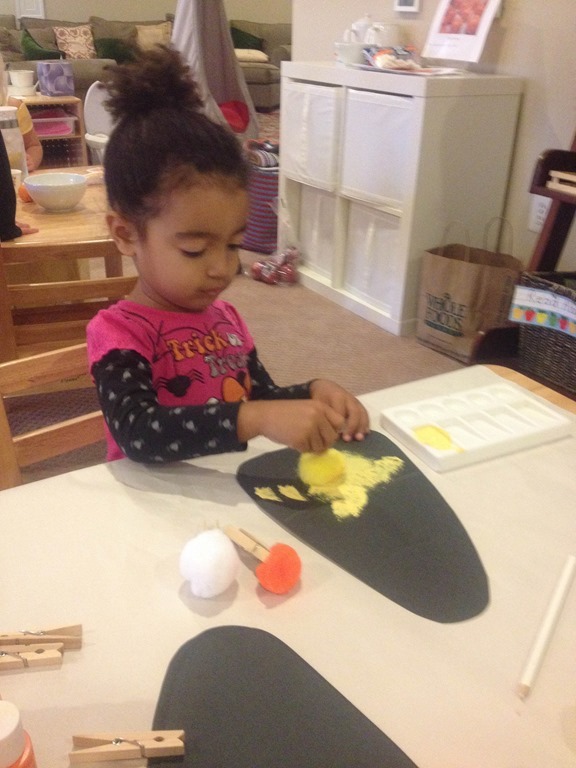 These activities then build the skills to sort colors, shapes, leaves, or attributes of objects. 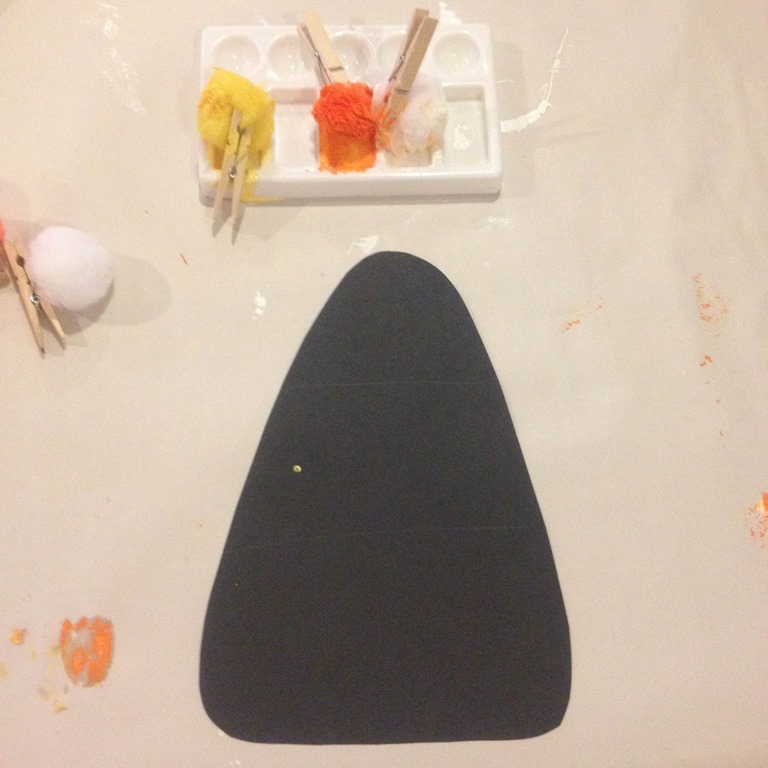 More color mixing coming soon! 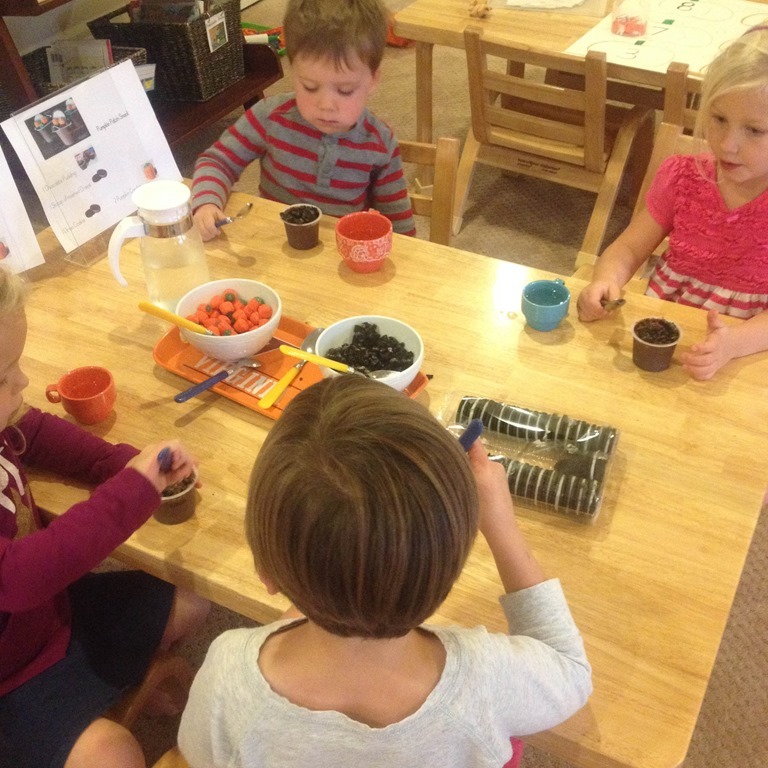 Categories: education, home based preschool, home preschool, play based learning, reggio emilia inspired | Tags: fall, halloween, halloween fun, halloween preschool activities, parent visitors, parents and teachers, play based learning, play based preschool, preschool art | Permalink. 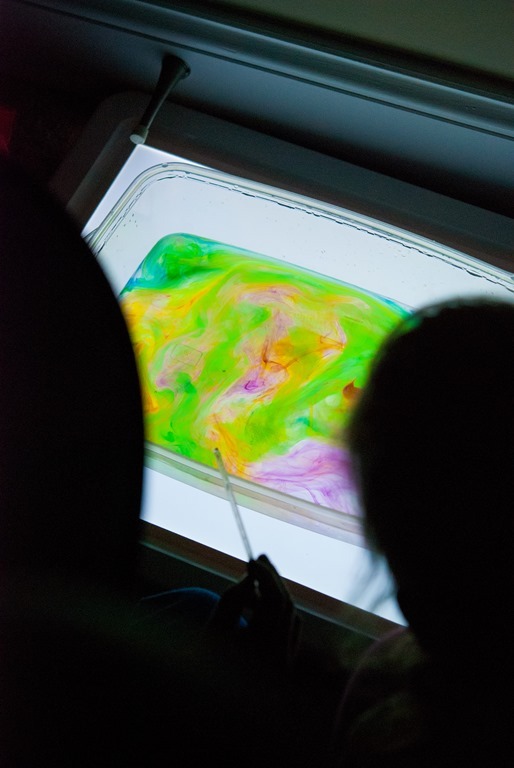 The kids in the class have been overjoyed for our most recent sensory experience…Gak. Some people have different names for this fun part liquid/part solid/part slime/part liquid/part moldable stuff, but I call it Gak! I made two different batches of Gak with my groups. 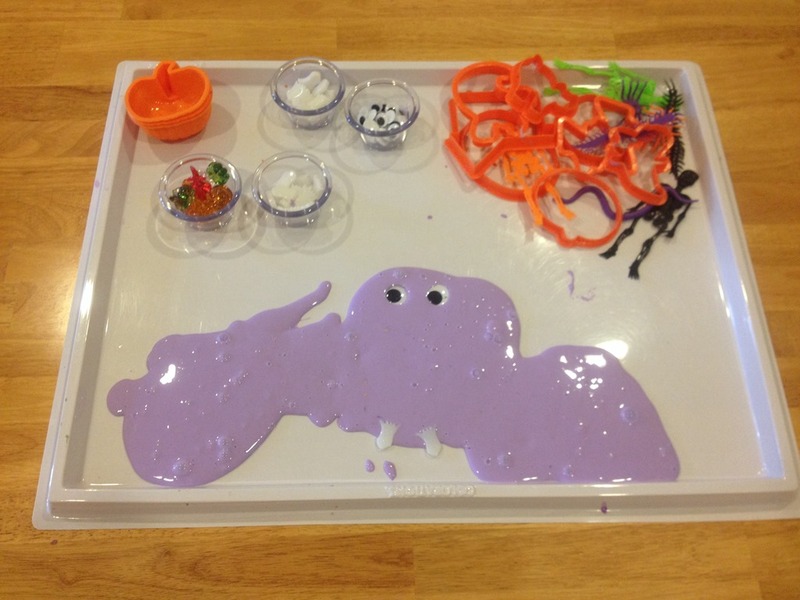 One group got to make orange gak and the other group made a batch of purple Gak. 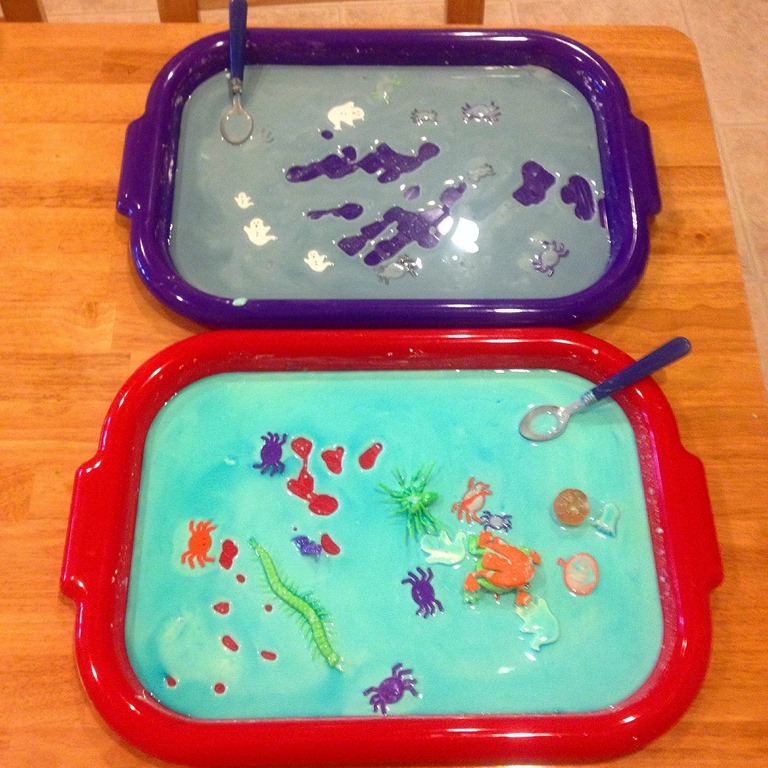 They loved mixing up this slimly solution and watching the glue change right before our eyes! This is a fun process from start to finish. The measurements do not have to be exact but it’s a good idea to start with the proportions below for the first batch. 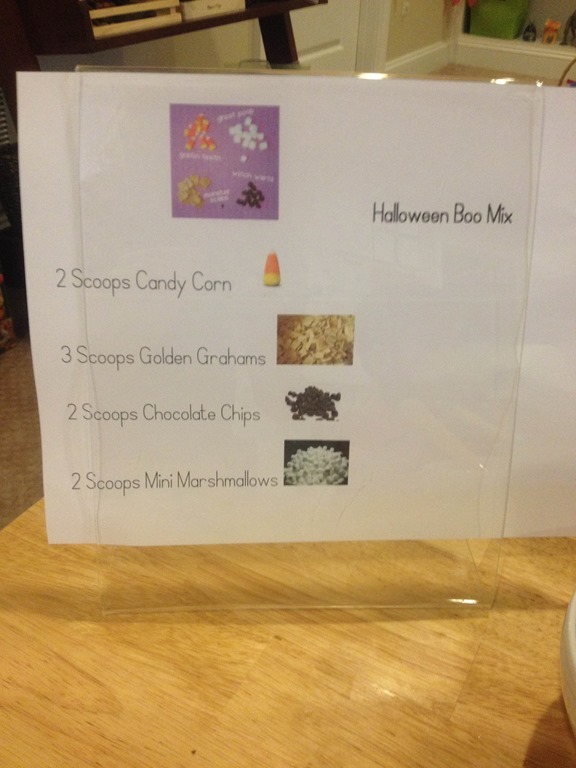 Just change the amounts of each ingredient to get a new and interesting batch of goo. This recipe is based on using a brand new 8 oz bottle of Elmer’s Glue. Empty the entire bottle of glue into a mixing bowl. Fill the empty bottle with warm water and shake (okay, put the lid on first and then shake). Pour the glue-water mixture into the mixing bowl and use the spoon to mix well. While stirring the glue in the mixing bowl, slowly add a little of the Borax solution. Immediately you’ll feel the long strands of glue and water starting to connect. It’s time to abandon the spoon and use your hands to do the serious mixing. 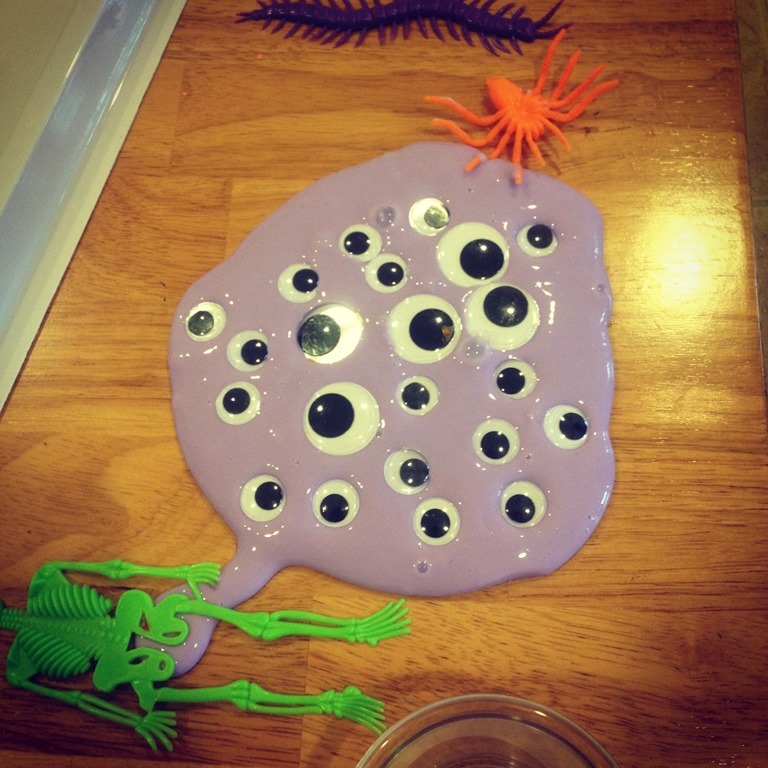 Keep adding the Borax solution to the glue mixture (don’t stop mixing) until you get a perfect batch of Gak. I like mine with a bit more “glue” and a little less “slime” so I usually end up adding a bit of glue at the end of the recipe. You can decide how you like your Gak! It stores wonderfully in a Ziploc bag. It will stick to your carpet or sometimes clothing, so be careful where you play with your Gak…kitchen is probably the best place. 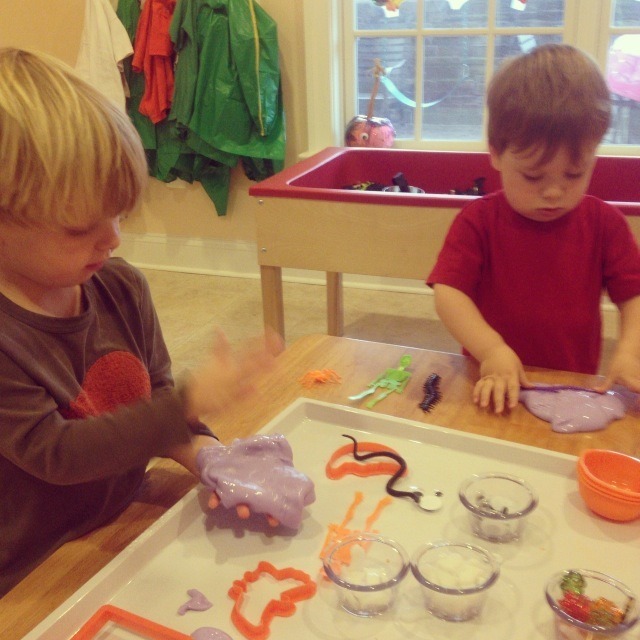 Here are some pictures of us playing with it at Crozet PlaySchool…. 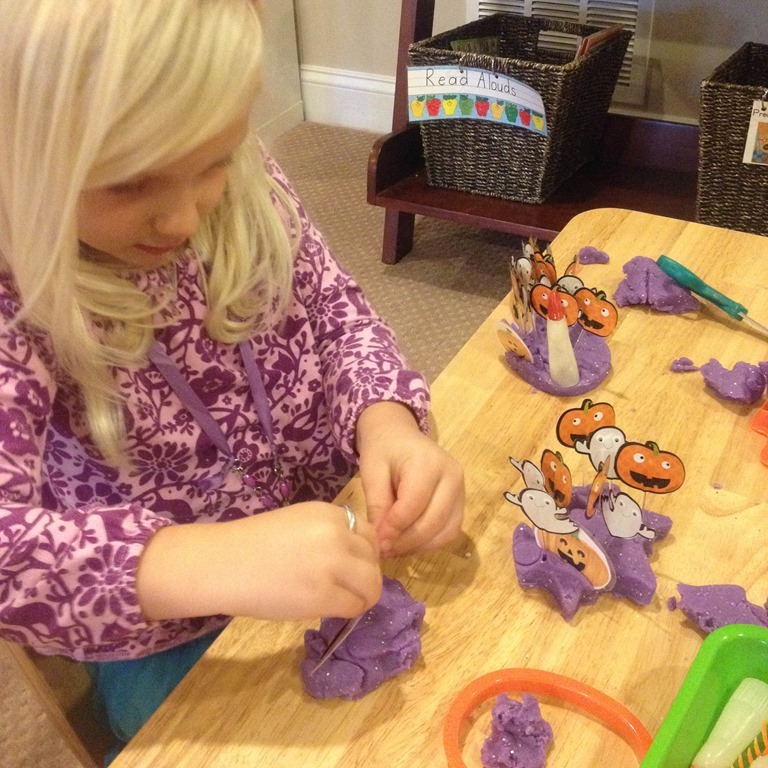 Ellie was showing us how the Gak stretches!!! L was making imprints in the Gak. You can see the outlines of the spiders underneath her snake. 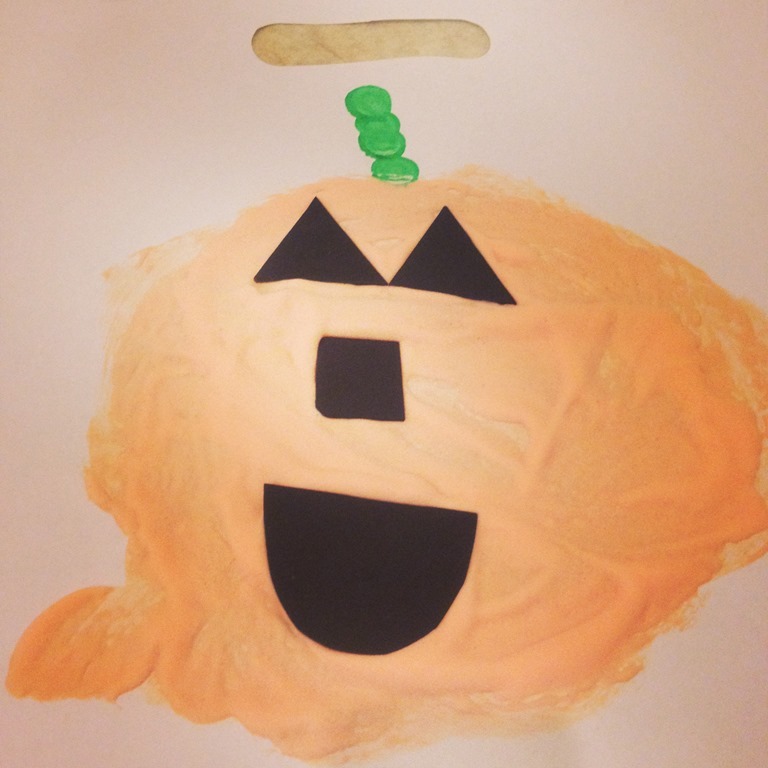 Gak will hold a shape or an imprint for a few minutes before it starts to disappear. Such a fun texture to watch! L is pounding out his Gak while D is making some imprints. D told me that he made a Gak monster, isn’t it great?! 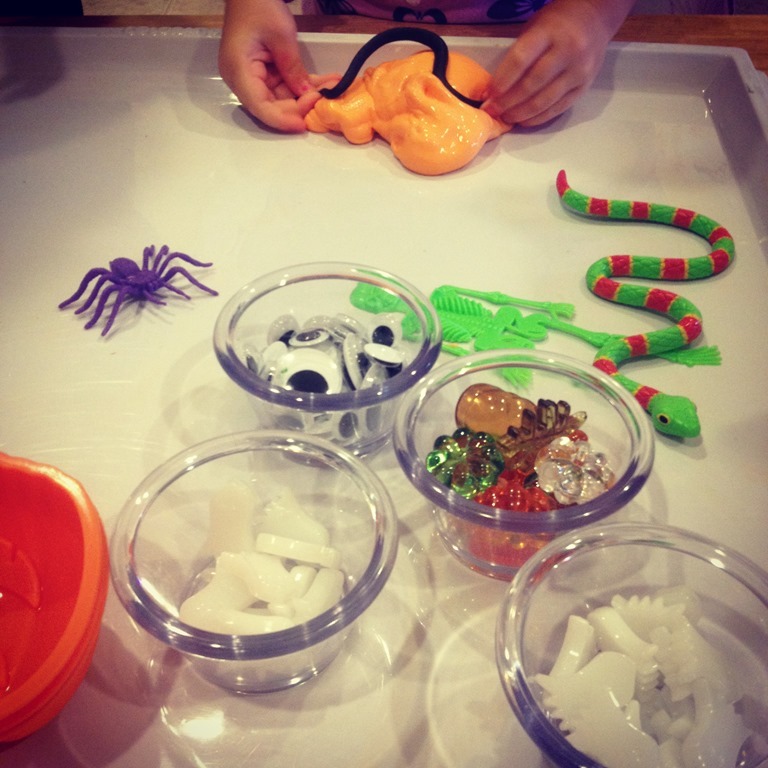 Categories: play based learning, preschool, sensory play | Tags: halloween, halloween fun, halloween preschool activities, holidays, sensory, sensory materials, sensory play, sensory tray | Permalink.